Why offer a gift with purchase? A gift with purchase (GWP) is a great way of expanding your business. Our team works with brands around the world to design and manufacture unique gifts with purchases to entice new and old customers to buy more of your product. Done well, GWP promotions jump from the shelves. 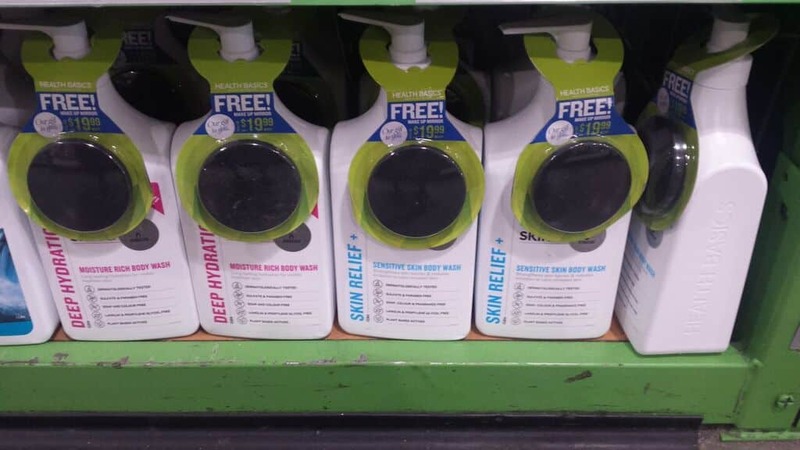 When used in conjunction with POS displays and in store advertising they really bring the message home that consumers are buying something worthwhile, and that the brand running this campaign is giving you something extra for free. Therefore by using promotional products you can also create urgency by having limited production runs. Some case studies below highlight how Gift with Purchase marketing can work. The slick key chain offered to customers further promotes the luxury brand and pleases buyers – so a win win! Key chains are a great way of enhancing customer contact with your brand and lengthening brand visibility. 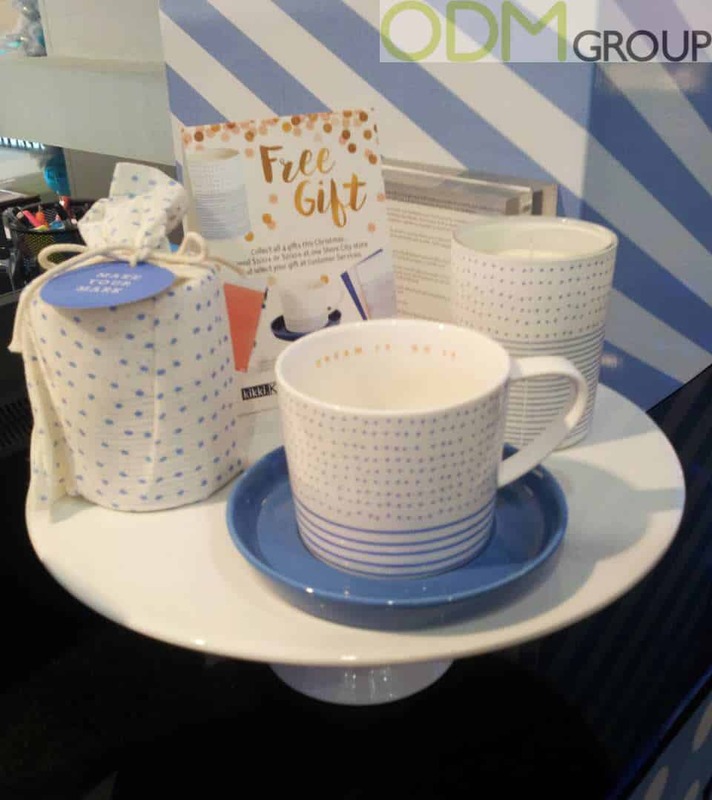 It’s good to have your own special mug for drinking tea and coffee, and in this on pack promotion, Davidoff Café have decided to give away a free mug as part of their special coffee promo. 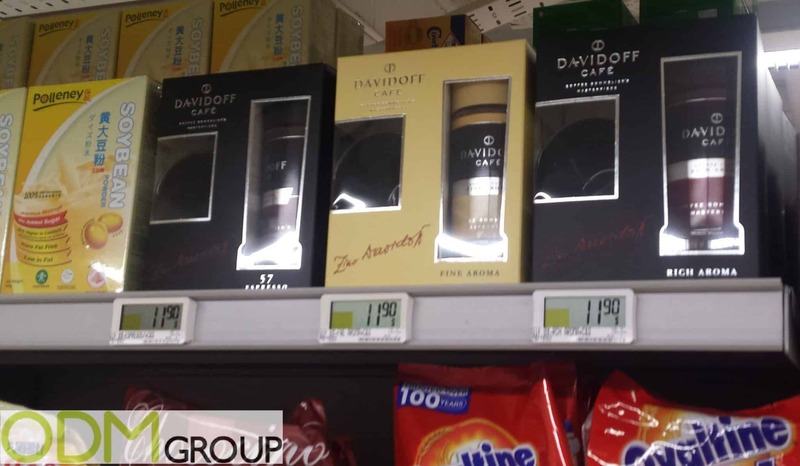 Davidoff Café is known for its rich coffee aromas and taste, making this promotion one offer you cannot resist. Kronenbourg beer company is over 300 years old, founded in 1664 by Geronimus Hatt in Strasbourg it has managed to stay with the times while keeping that fantastic taste. 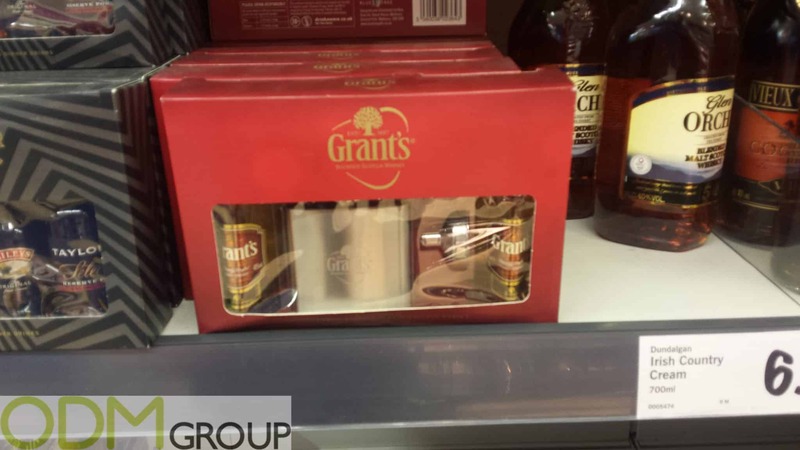 This promotional glassware set is no different to past promotions, still attracting customers centuries onwards, the brand certainly knows how to keep its customers refreshed and a part of their respectable culture. With thousands of different wine promo and wine varieties to choose from in an already saturated industry, it can be hard for wine brands to stand out to their potential customers that past their brand everyday. 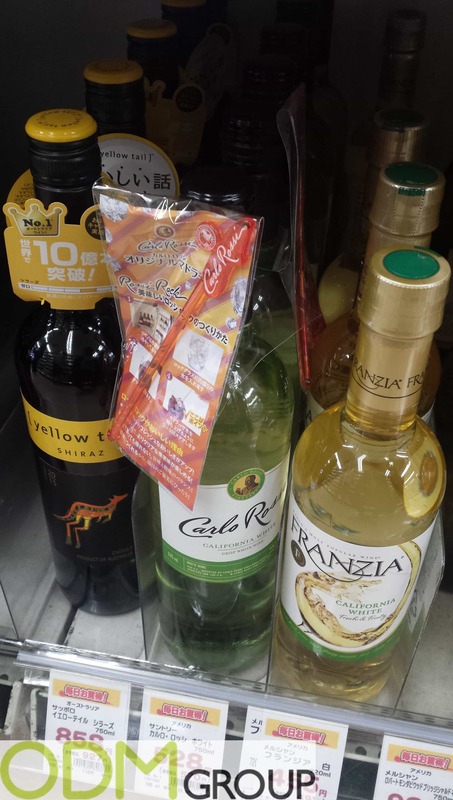 In this promotion, Carlo Rossi, Californian wine expert makers since 1975 are doing a free gift with purchase promotion in this Japanese supermarket. And are giving away a free Carlo Rossi stirrer with each bottle purchased. Strongbow is a dry cider produced by H. P. Bulmer in England and was first introduced in 1962. 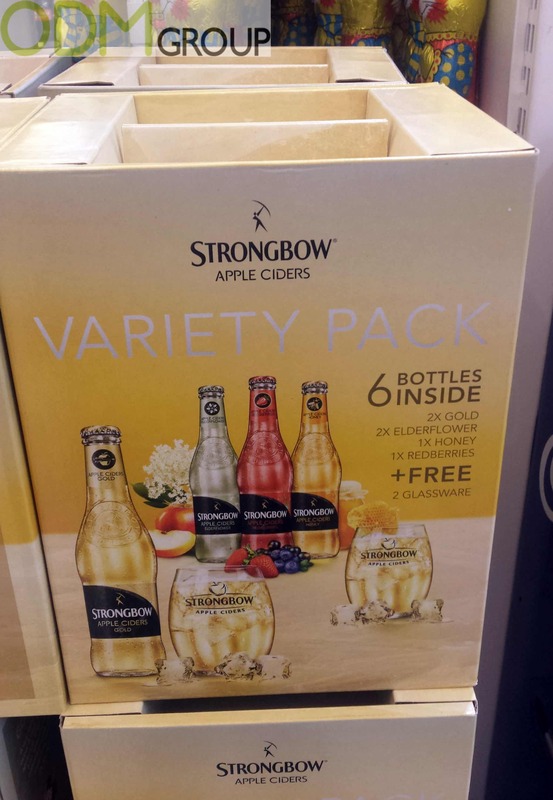 With a huge popularity of cider, especially in the UK and Europe, this multi fruit flavoured pack is the perfect way to start those long summer days and warm nights. As well as an array of flavours, this alcohol promotion is offering a free glass with the purchase of any variety pack. Giving you the chance to sit back and enjoy cider the true Strongbow way. 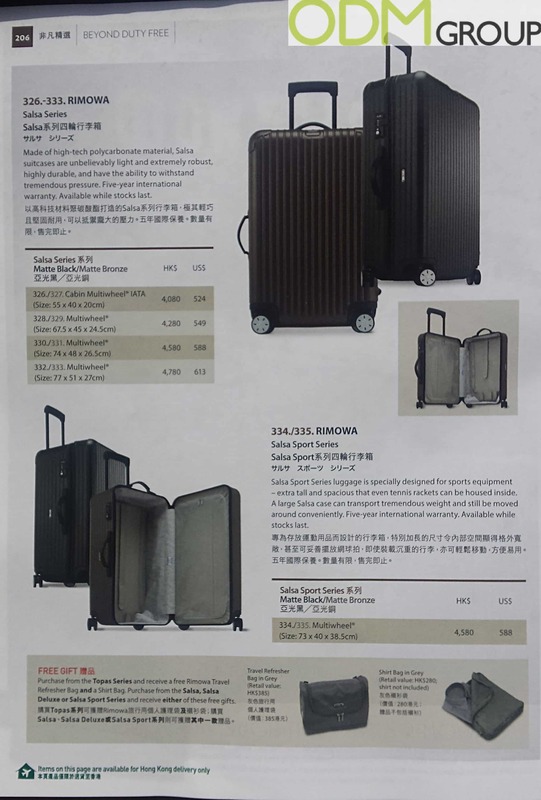 Famous German luggage and accessories brand, Rimowa are advertising their magazine promotion in an airport duty free magazine. 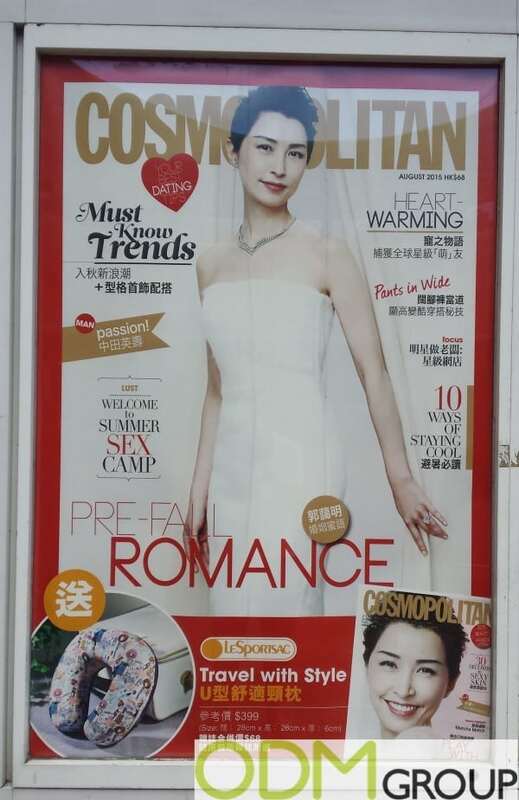 Using a magazine promotion especially in an airport is effective for advertising more expensive brands at a cheaper price than the high street, making customers more likely to purchase your high-end product. Approximately every 6 out of 10 people need Glasses, Contact lenses or correctional eye surgery. This creates a huge market for those to help and an even bigger potential market to introduce more convenient solutes. 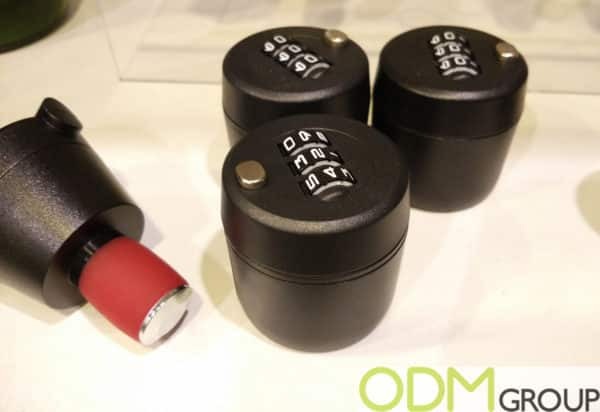 Opti-Free is offering a great and unique promotional solution to the optical industry. 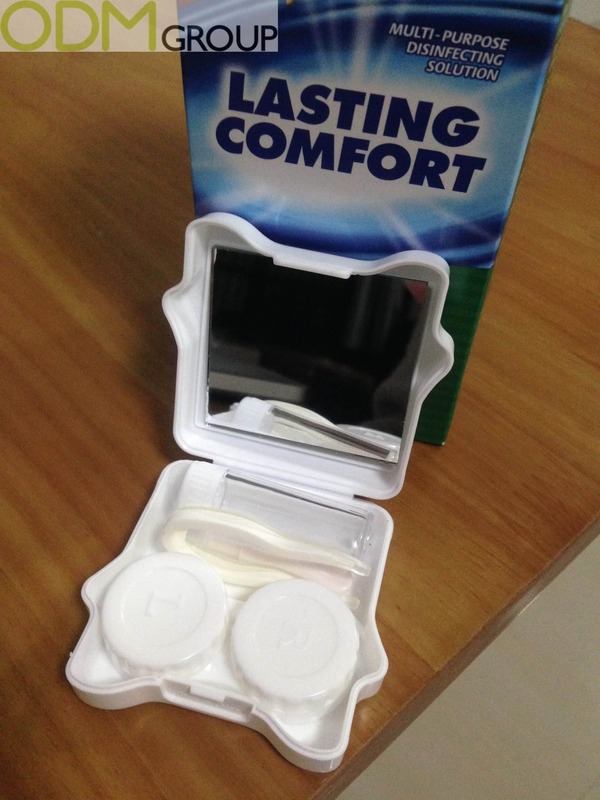 This gift creates convenience for anyone who has the daily struggles of applying contact lenses to their eyes. An in-pack promotion featuring a free drinking glass or glasses is an easy yet effective way to promote your brand image and become more competitive over other brands. 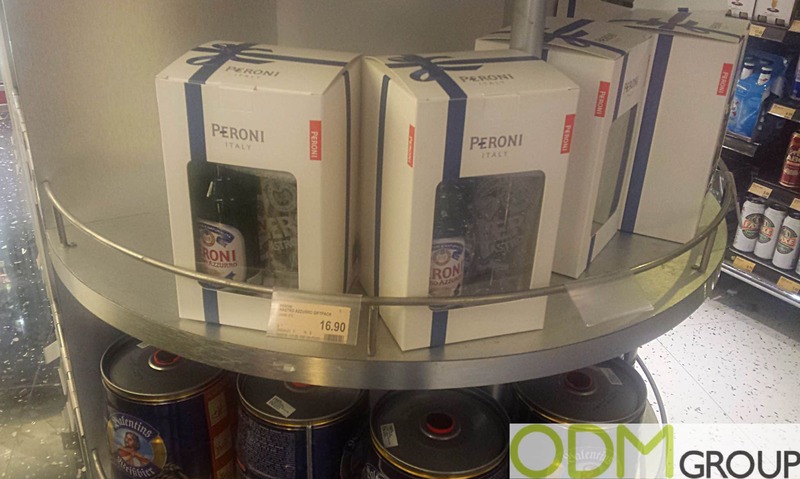 And with an already saturated beer industry, Italian beer brand Peroni, are offering a free Peroni branded glass in their in-pack promotion in a Singapore supermarket to stand out. Kung Fu Panda has just been released in China and is proving to be very popular throughout the country as well as the western world. 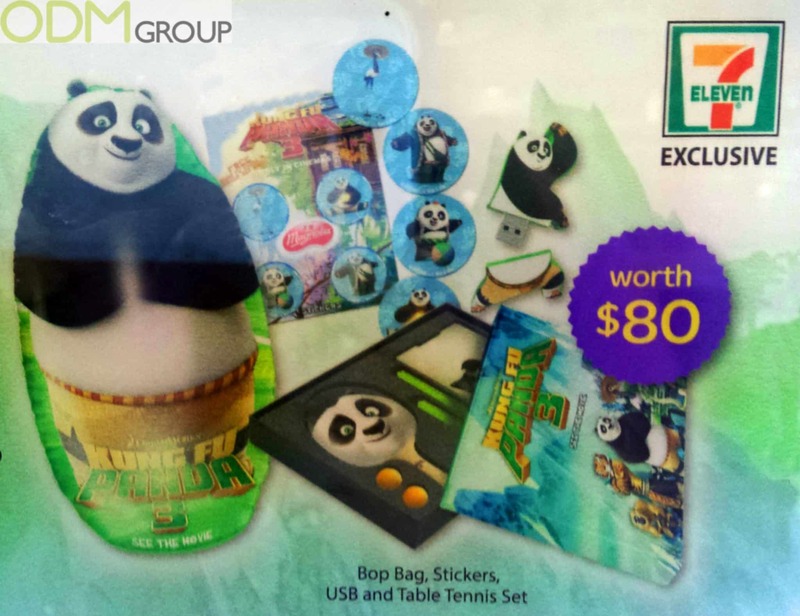 Here you can see the company Magnolia giving away a range of Animated movie promotion gifts for customers purchasing their products exclusively at any Seven Eleven stores. With the soon to be release of Batman vs Superman in cinemas, the excitement is rising and a Batman vs Superman promotion is a great way to increase your brands image and sales at such a time. 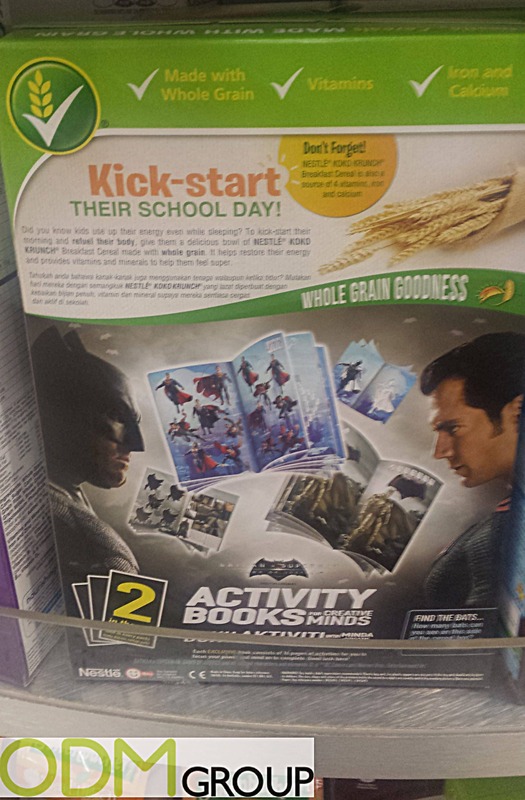 Transnational food and beverage brand, Nestle have created their own Batman vs Superman promotion, and are giving away a free activity book in every pack of their Koko Krunch cereal. Whether you’re a tea lover, tea hater or just British you will have heard of the famous beverage brand Twinings and their huge selection of tea made for any persons taste. 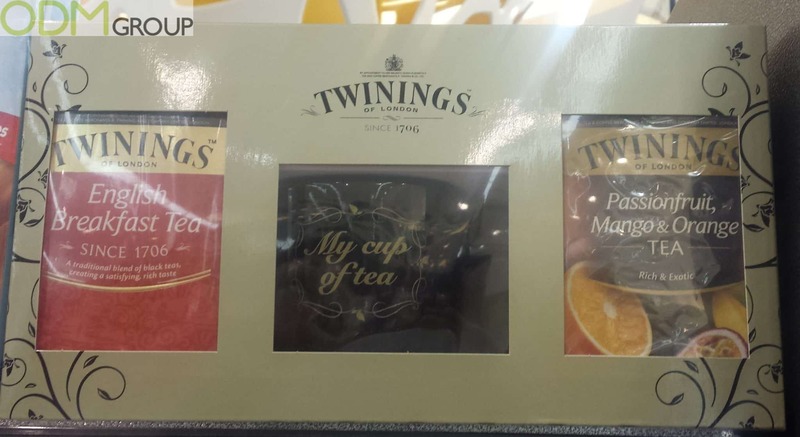 In Singapore the company is offering a fantastic tea promotion, that gives customers the chance to not only receive their classic “English Breakfast” tea but a “Passion Fruit and Mango” tea as well – all to be used with a fantastic “My Cup of tea” mug as a promotional gift. 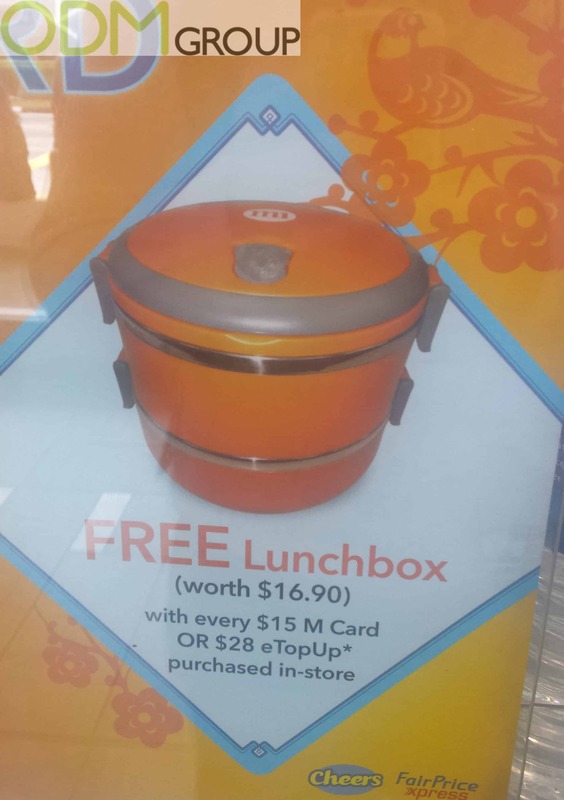 M1 Mobile are targeting the Asian market with a strange yet attractive promotional offer of a free lunch box with the purchase of any $15 M Card sim or $28 eTopup Purchased in store. Not only does the offer give you the lunch box as a free gift with purchase but the offer is worth more than the M Card sim itself – $16.90. Lee Kum Kee is a Hong Kong-based food company which specializes in manufacturing a wide range of Chinese and Asian sauces. 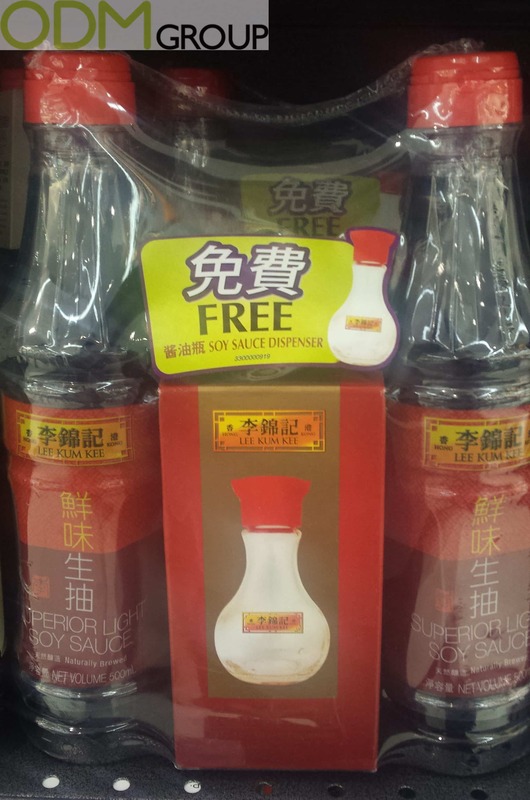 Now the company is promoting its multi-pack of soy sauce by offering any customer a free dispenser as a promotional gift. Lee Kum Kee produces over 200 Chinese-style sauces Including: soy sauce, hoisin sauce, XO sauce and chili sauce. As well as sauces they also sell a mixture of cooking ingredients and one step recipes. 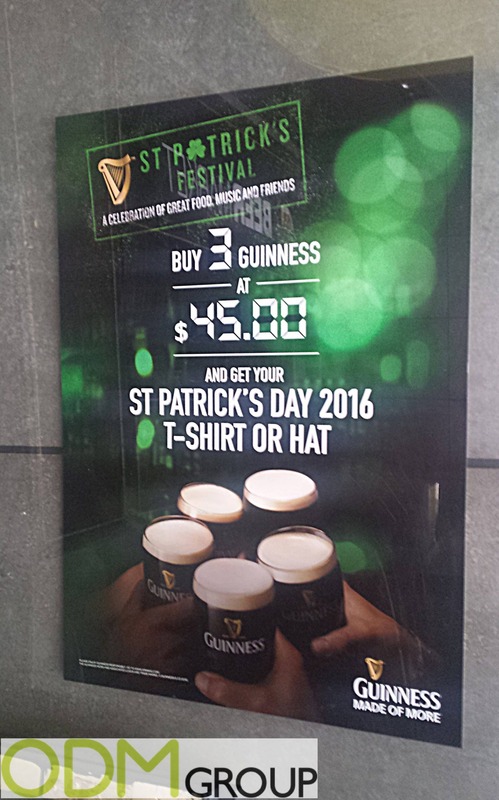 Irish beer brand, Guinness, are promoting St Patricks Day merchandise with this eye catching Shamrock green display poster featuring a promotional offer. With a poster this vivid, it will surely attract the attention of passers-by! 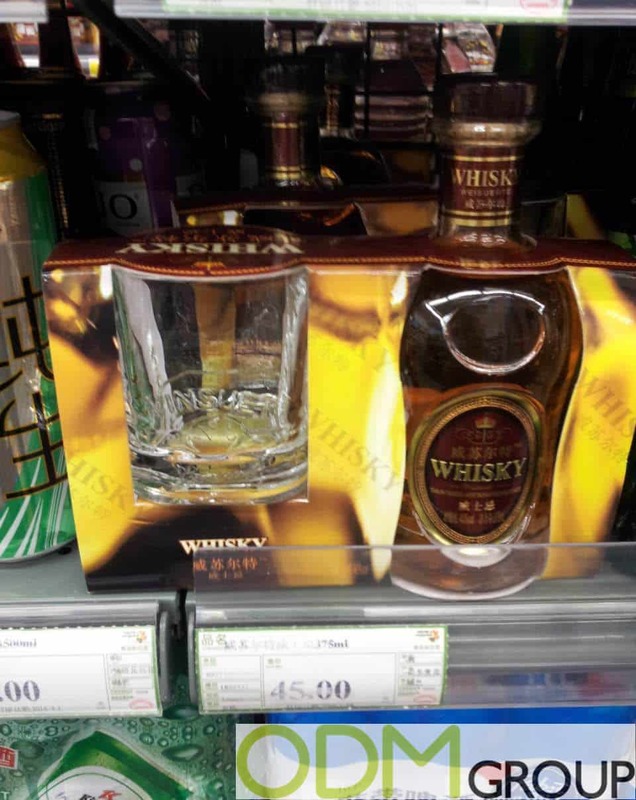 A Chinese Whisky brand is offering a free whiskey promo glass in every pack when you purchase a bottle. This type of promotional offer is commonly used in the alcohol industry and for a number of reasons. An on pack promo glass is good for increasing brand awareness and also works well as an incentive purchase. 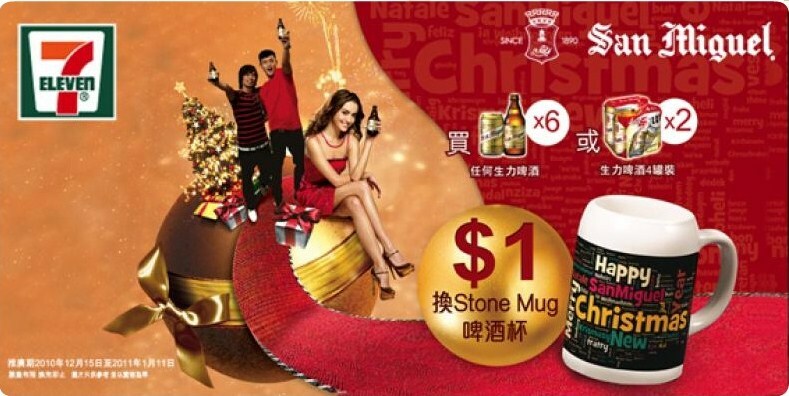 Coca Cola are at it again with another promotional offer specific to Hong Kong and China. 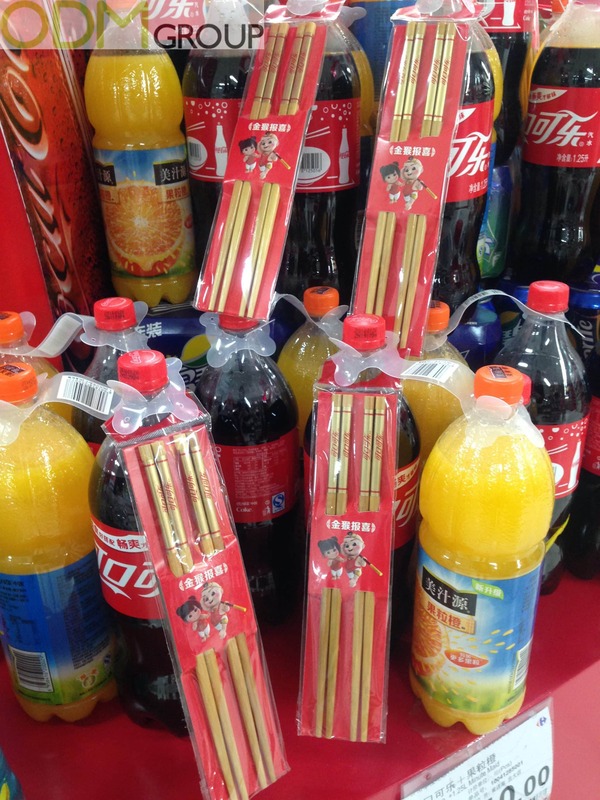 This Gift with Purchase offers customers the chance to get the great refreshing taste of Coca Cola while at the same time receive two pairs of chopsticks with any 1.5 L of their original drink. 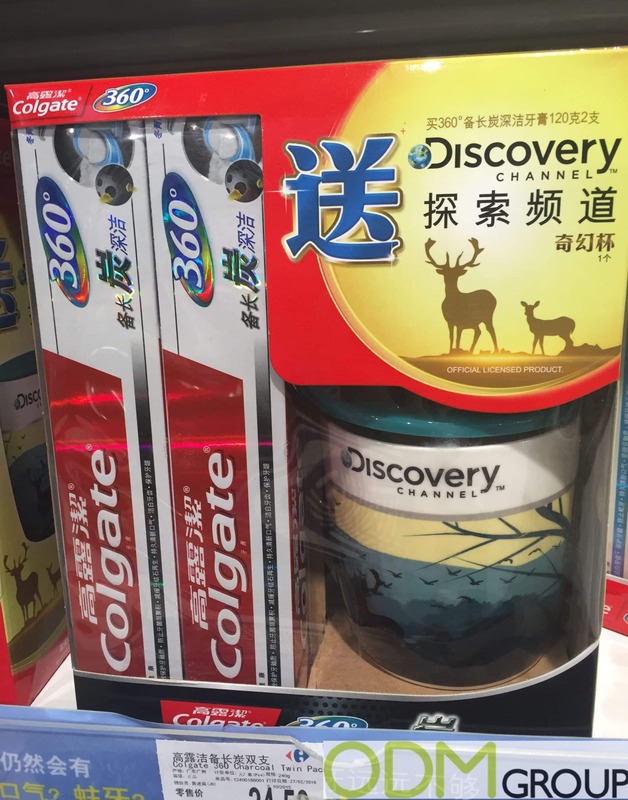 A free gift mug makes an extremely useful gift with purchase idea, and a Carrefour store in Zhuhai, China, are promoting this free Discovery Channel gift mug with the purchase of products by well known toothpaste brand, Colgate. Jack Daniels is the world leading brand of whiskey, known by all for it’s great taste, fiery flavors and it’s integration of drinking and music alike. This Alcohol Promotion offers those old and new to the word of whisky by giving them the chance to follow the true essence of what the drink is about. 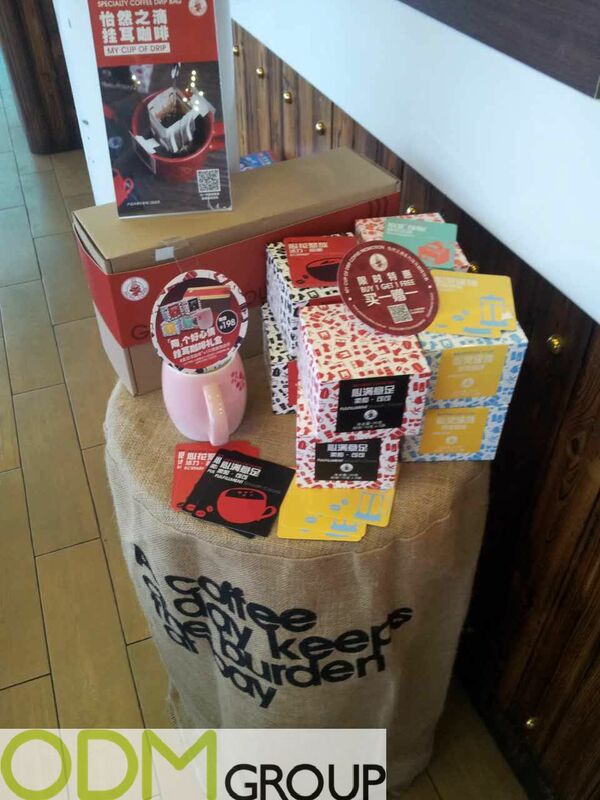 Pacific Coffee, a leading U.S Style coffee company have implemented a gift with purchase campaign for their coffee, represented by ‘My Cup of Drip Coffee’. This gift with purchase is a choice between various coloured boxes of flavoured coffee and a promotional mug in a set with the special offer of buy one get one free. 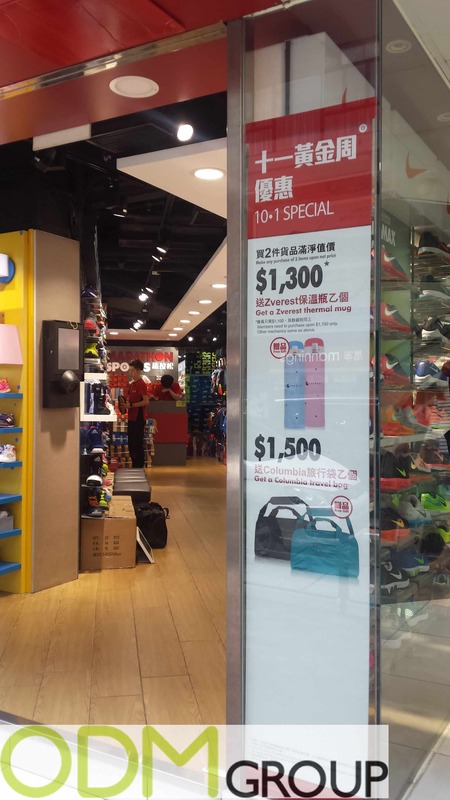 With more than 40 years experience specialising in running and walking products, this Marathon Sports store in Hong Kong, are currently advertising promotional items with every certain amount of money spent on purchase in store. This is an easy way to increase the sales of items that have less awareness. Everyone needs a way to transport their essentials, especially toothpaste. Most importantly no one wants to start their holiday in a minty way with it all over their suitcase, clothes and other travel essentials. 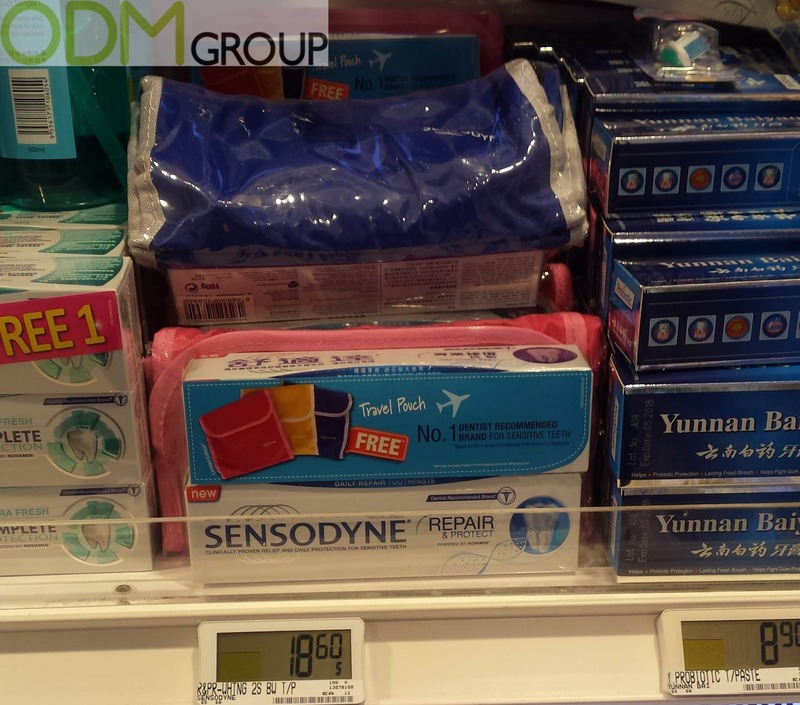 This great promotional free gift by Sensodyne offers customers a travel pouch with the purchase of their product, making the transport of toothpaste that little bit easier and a little less messier. Furthermore this great idea offers the customer a chance to carry other toiletries in the pouch rather than scattered about their bag or suitcase. 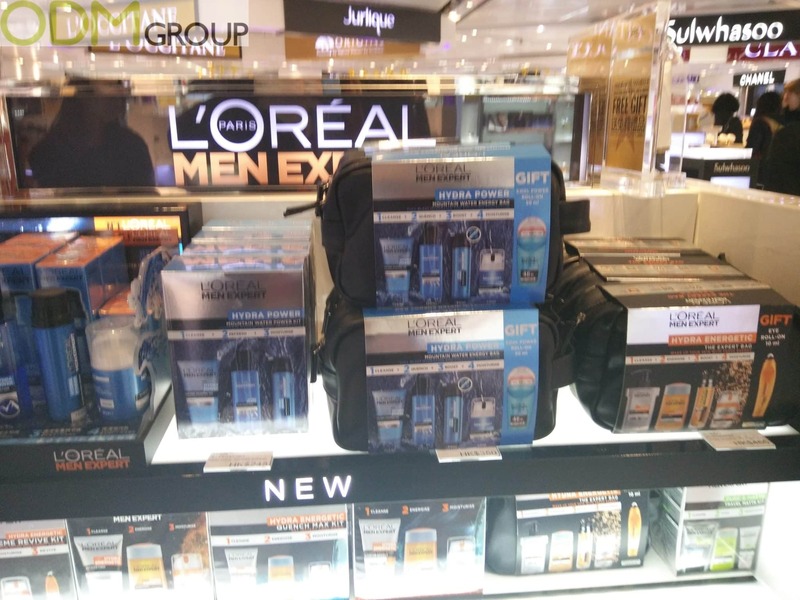 For travellers and cosmetic lovers alike, this on pack promotion by L’Oreal offers customers the chance to not only receive their well known travel bag with the essential male toiletries, but the chance to increase their fragrance collection with an extra roll on deodorant. Collectible freebies with drinks are a great incentive for making customers feel attracted to buying your product. 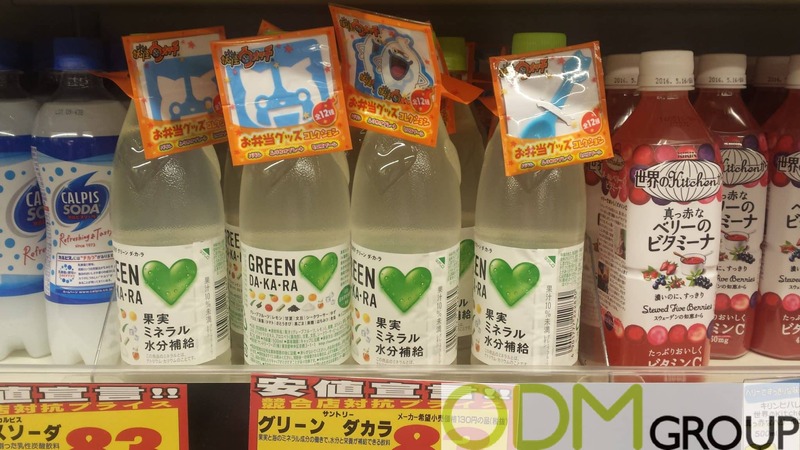 This Japanese drinks company have done just that and are currently giving out collectible freebies with drinks with every purchase. Remy Martin is the name of luxury; selling premium cognac around the world. 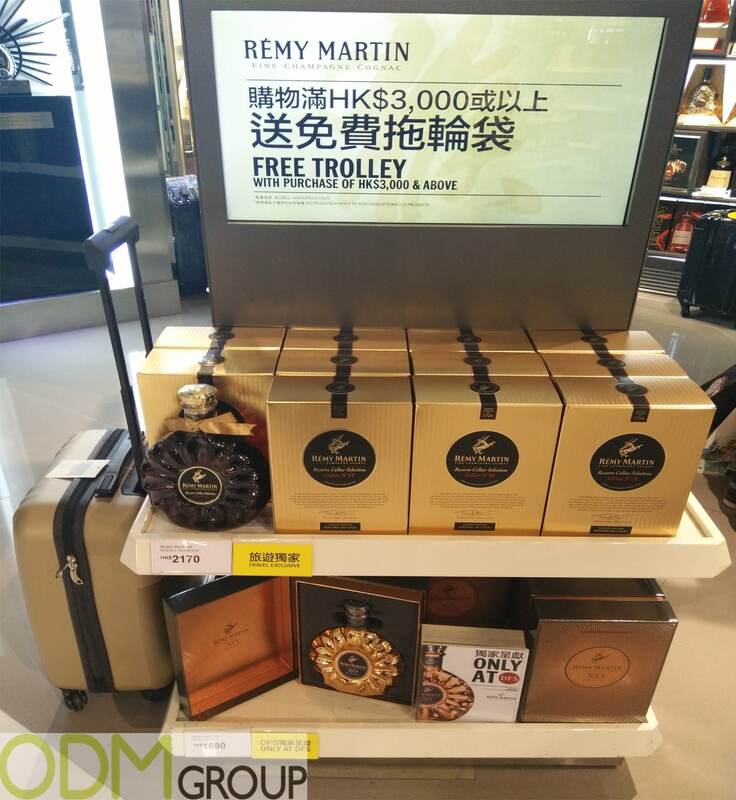 Their latest premium marketing strategy in Hong Kong offers customers the chance to get a free travel trolley with any purchase that exceeds $3000 HKD. 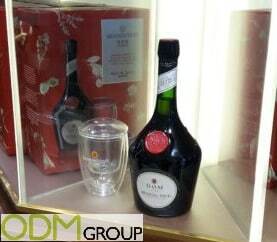 Remy Martin is a French firm that primarily produces and sells cognac, specializing specifically in Fine Champagne Cognac. The company was founded by Remy Martin in 1724, giving the brand nearly 300 years to build it’s premium and prestigious image. The deep south is known for its great tasting BBQ flavors, Bourbon spices and of course country music. So it’s no surprise that Jim Beam, Kentucky’s leading bourbon brand, knows how to sell their product before someone has even tasted it. This latest branded gift set offers all whiskey lovers and Jim Beam fans the chance to get the ultimate drinking set. With over 150 years in creating some of the finest wines, Jacob’s Creek are putting their love and care into a new promotional product, offering a free travel bag with any bottle purchased at selected duty free stores. In 1847, along the banks of Jacob’s Creek, Australia, Johann Gramp had a vision, “to create great tasting wines that reflect the true character of the grapes and the land”. Nowadays this vision has progressed with the company, expanding and growing massively. With it’s first export in 1984 to the United Kingdom it has continued to spread its remarkable taste globally for over thirty years. 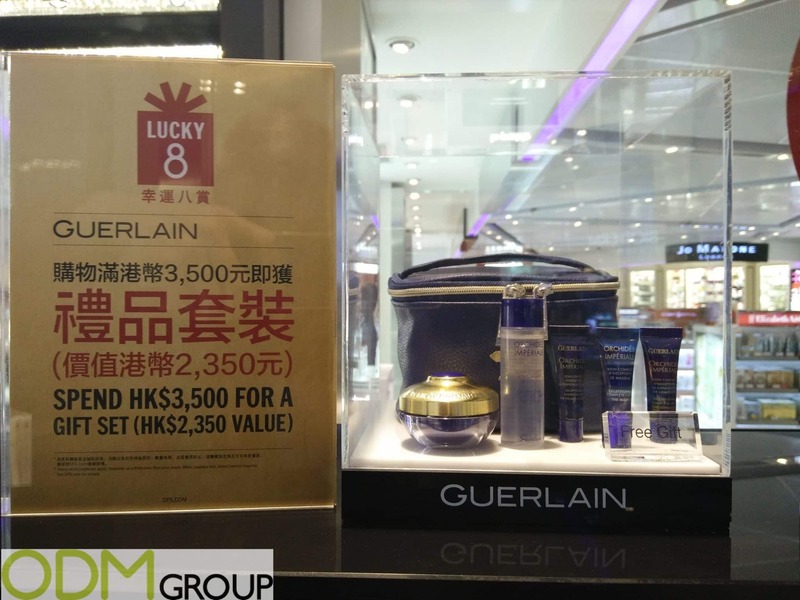 Guerlain is a famous luxury French cosmetics, fragrance and skin-care brand, and being amongst one of the oldest in the world founded in 1828 this promotional cosmetics bag featuring their luxury skincare products is a must have. 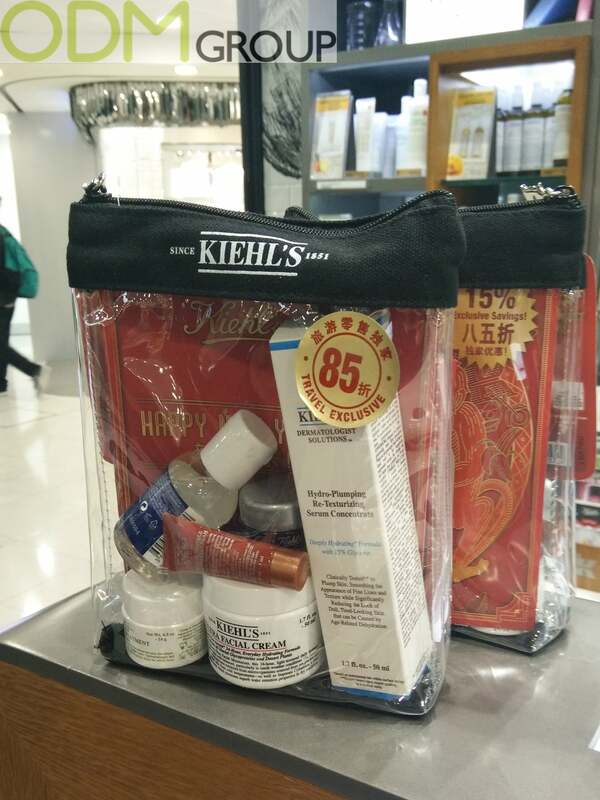 In order to enjoy this promotional cosmetics bag simply spend HK$3,500 or more on all in-store purchases, and with an actual RRP of HK$2,350 this is one purchase you wouldn’t want to miss! A long time ago in a galaxy far, far away there was a huge promotional presence throughout the world, from plush toys to cutlery, Star Wars ruled all. 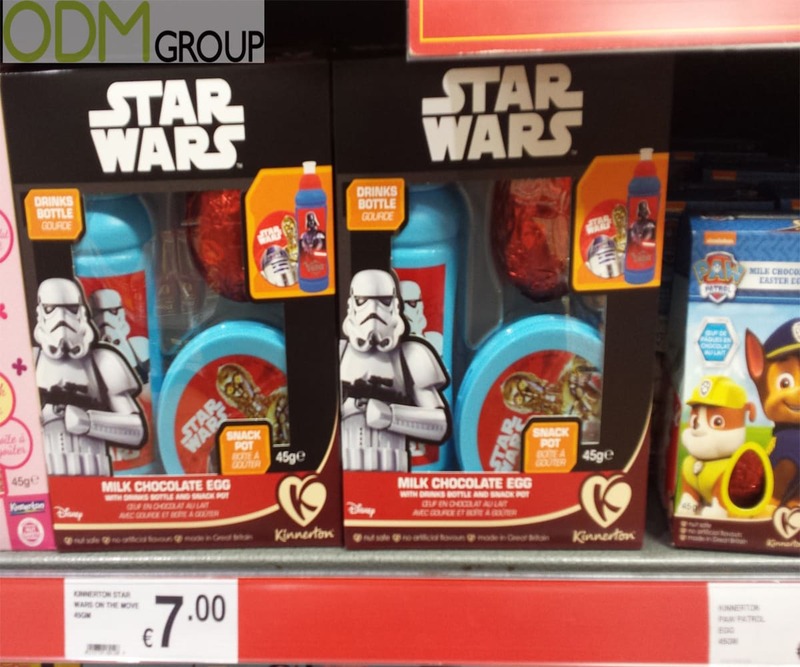 Kinnerton, the UK branded chocolate company, have created a fantastic Star Wars merchandise idea, offering customers the chance to get their hands on a limited edition Star Wars drinks bottle with the purchase of any milk chocolate egg. 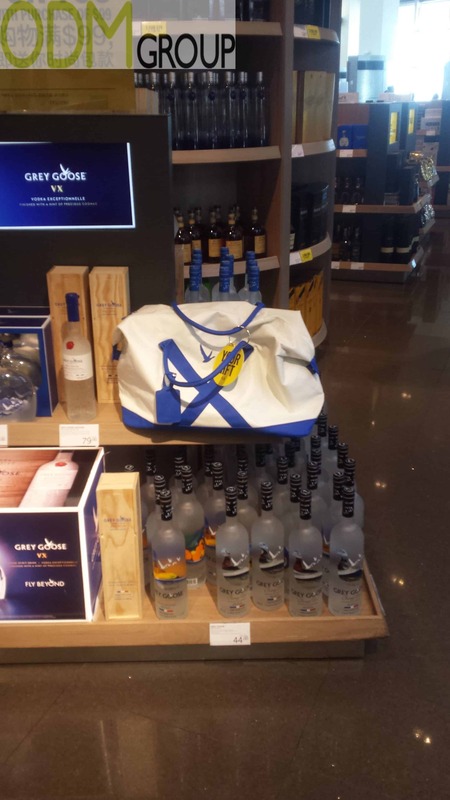 Sports wear and accessories never get old and Grey Goose knows it! This GWP sports bag is a great gift idea, offering customers a free bag with any liter bottle purchase of their famous vodka. Grey Goose is premium Vodka brand founded in 1997 and uses soft winter wheat sourced from Picardy, a grain-growing region in northern France. The Vodka itself is distilled five times and is made in the Cognac region of France. Chinese New Year is over and the year of the monkey has begun. With Keihl’s promotional PVC bag they have entered the new year in the right way, offering customers a convenient and gift filled cosmetics bag to aid them with carrying all those important toiletries wherever they go. What’s a flask without whisky or whisky without a flask? Well with this on pack promotion by Grants you don’t have to choose. 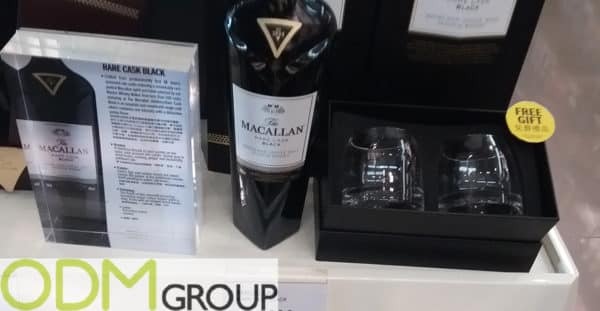 This promotion provides customers using Irish stores the opportunity to not only get two bottles of whisky but a fantastically branded flask as well. With the prestigious popularity of Scottish whiskey, Glen Deveron promote the success of their single malt product by offering a free gift with purchase on any of their thirty year old malted whiskey. 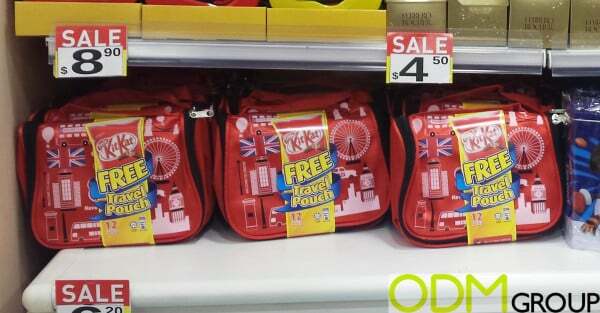 This duty free promo offers customers the chance to get themselves a travel backpack when buying their product. 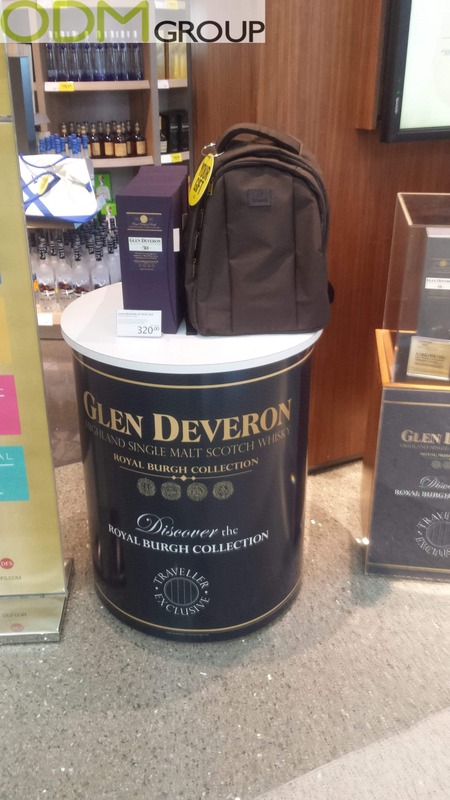 Glen Deveron, Royal Burgh collection, is exclusively available to international travellers at world duty free group stores at selected airports throughout the UK and Spain, exclusively offering them a world class aged whiskey. The famous Korean clothing company, Mind bridge, have recently implemented promotional mugs for their Valentine’s day promotion in China. This promotion offers a free gift with purchase of products that accumulate to the set price. 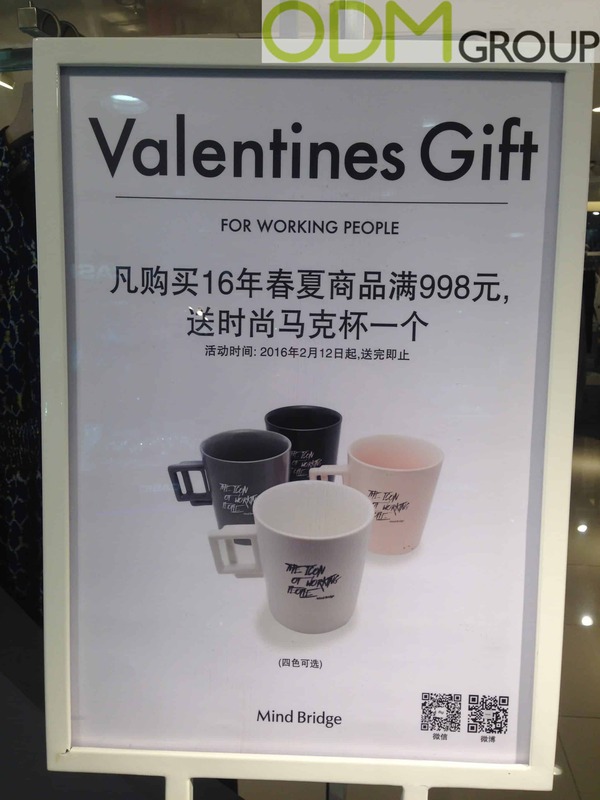 As a Valentines day promotion, consumers are offered a free mug when spending over the price of 998RMB, providing not only the clothing product itself as a gift, but the addition of a stylish mug for Valentines day. Yet again famous beer brand Guinness are giving away free gifts. This time there is a promotion with sports related background – a limited edition Rugby World Cup free glass. 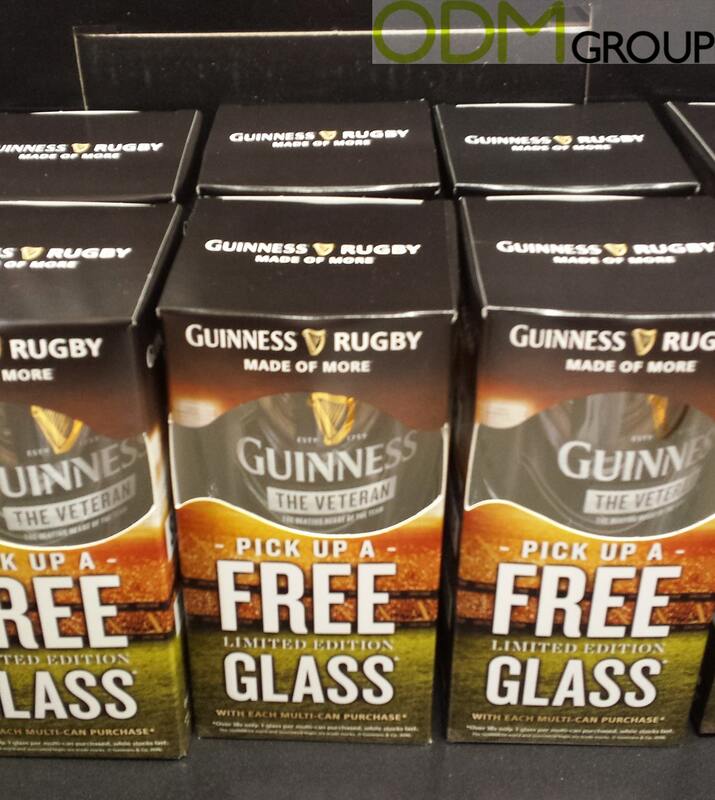 These pint Guinness glasses were specially released to co-incide with last year’s Rugby World Cup. In the packaging the glasses hold a can of Guinness, which makes it an excellent gift with purchase item. 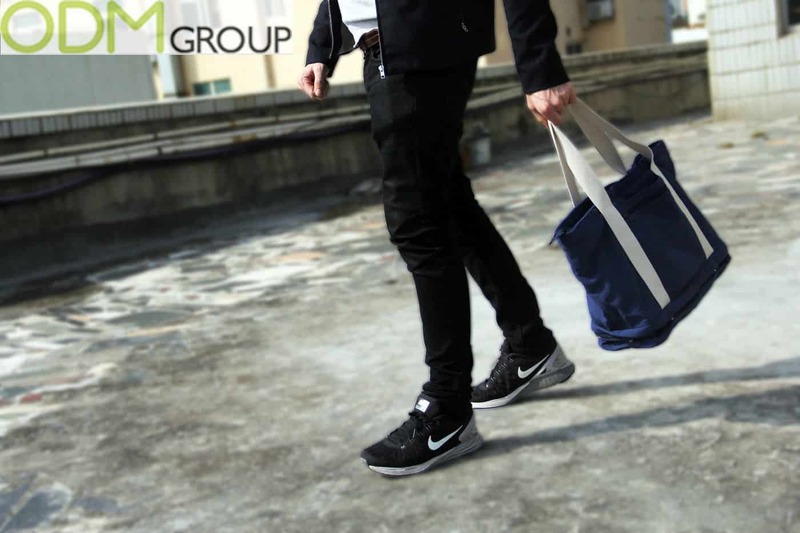 Currently in Chinese stores the world’s sports apparel giant Nike Inc. is implementing an excellent sports apparel promotion – giving away a branded canvas bag with any purchase absolutely for free! This kind of promotional bag stands out for its excellent material and printing quality. 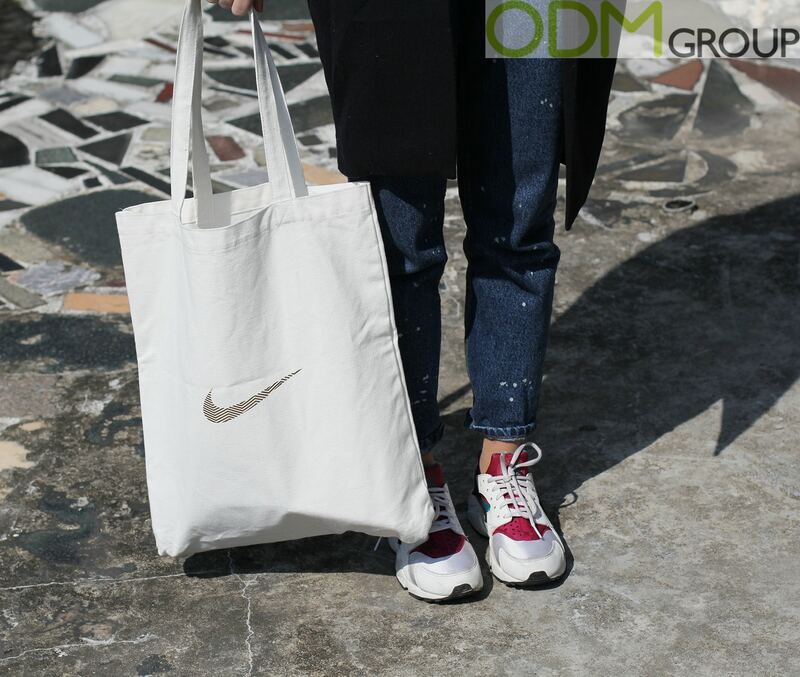 Nike, the international brand famous for supporting sustainable development and concern for environment, has chosen the most eco-friendly material for the totes – canvas. 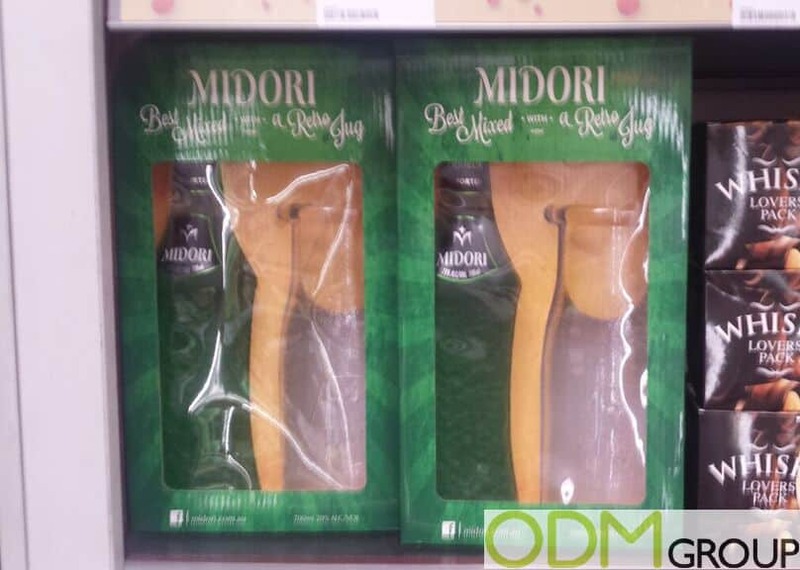 Japanese liquor company Midori are currently offering a free gift with purchase in stores. 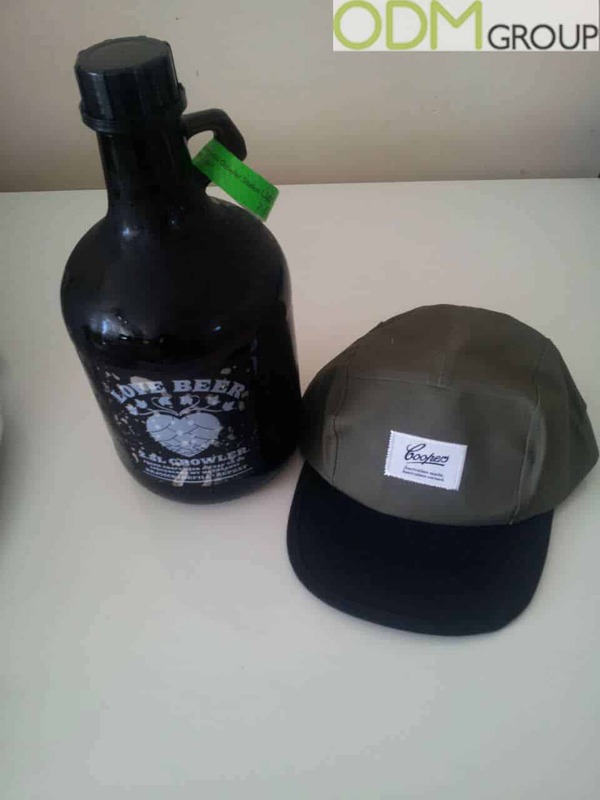 With each purchase of their melon flavoured liquor, you will receive a retro jug included in the price. A free gift with purchase can have numerous advantages for companies and brands alike, and this blog will highlight precisely what these are. 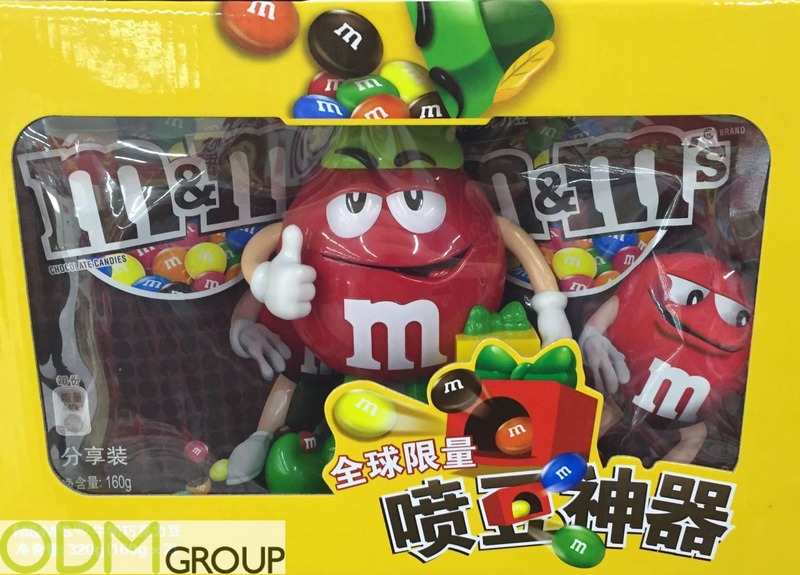 Confectionery giants M&M’s are brilliant at offering varied marketing promotional and strategies. They have marketing on pack promotions in the past, and here is another great example of this. Included in this promotional pack is a promo candy dispenser alongside M&M’s coveted sweets. This blog will show exactly why this is excellent thinking on their part. Leading healthcare product providers Colgate have recently implemented promotional mugs into their 2016 marketing plans with the use of a free gift with purchase. As an on-pack promotion consumers are gifted with these brilliant branded ceramic mugs. 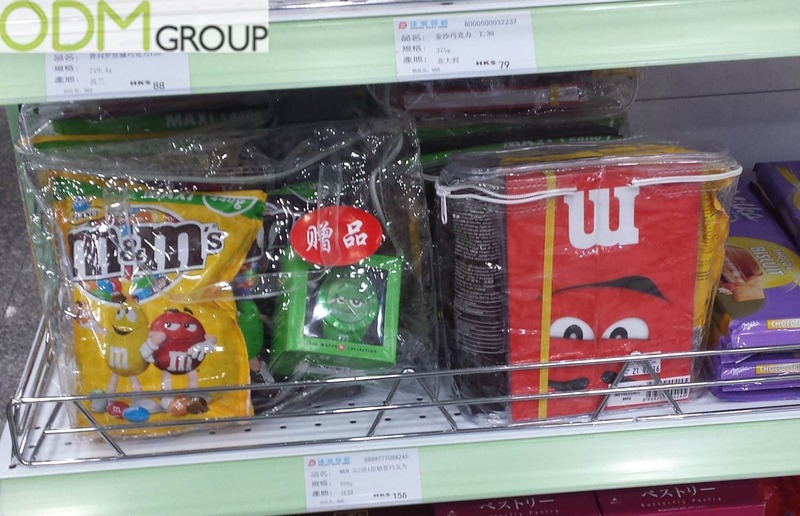 Confectionary giants M&M’s are great implementers of on-pack-promotions. Here is a brilliant example of a free promotional watch and customised notebook, on show at Hong Kong international airport. 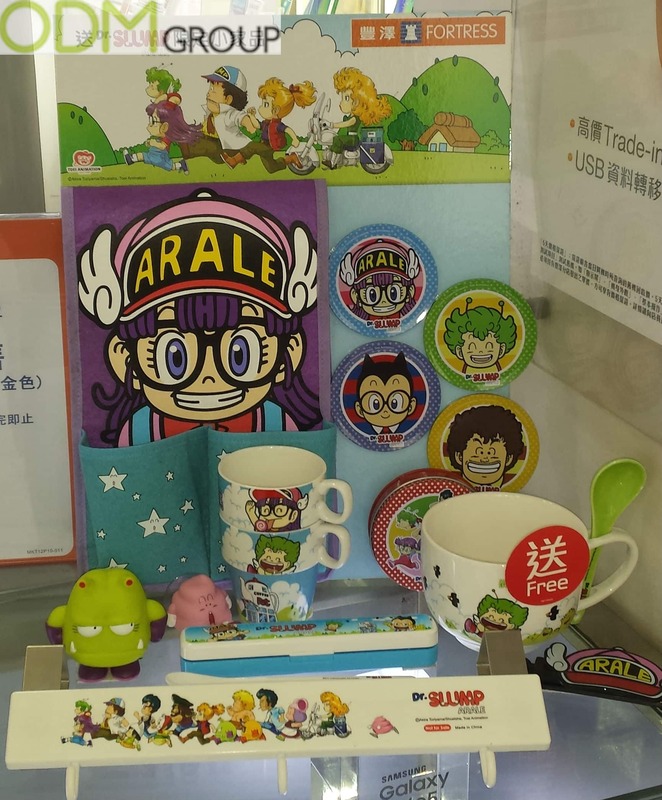 Here, electronic giants Fortress have teamed up with anime favourites Dr. Slump in order to gift a free promotional mug with purchases over $100 HKD. It’s hard to turn a street corner and not see a 7-Eleven in Asia. Here is a fantastic POS display showing off the variety of promotional toys available with purchase. Promotional gifts should be considered a crucial component to any brands marketing mix and plans for the new year. Here is a great example by Hong Kong electronic giants Broadway and HSBC. The pair couple these fantastic promotional products with a brilliant and well-designed membership scheme. This is a great way to entice a potential customer to purchase more in order to receive the items they desire. New Zealand body wash company Health Basics are currently running an on pack promo. Each time you purchase one of their hand washes, you will receive a make up mirror as a gift with purchase. This is a prime example of an effective and profitable marketing campaign. Although it is a simple concept, below we will analyse why a similar promotion could be of benefit to your business. 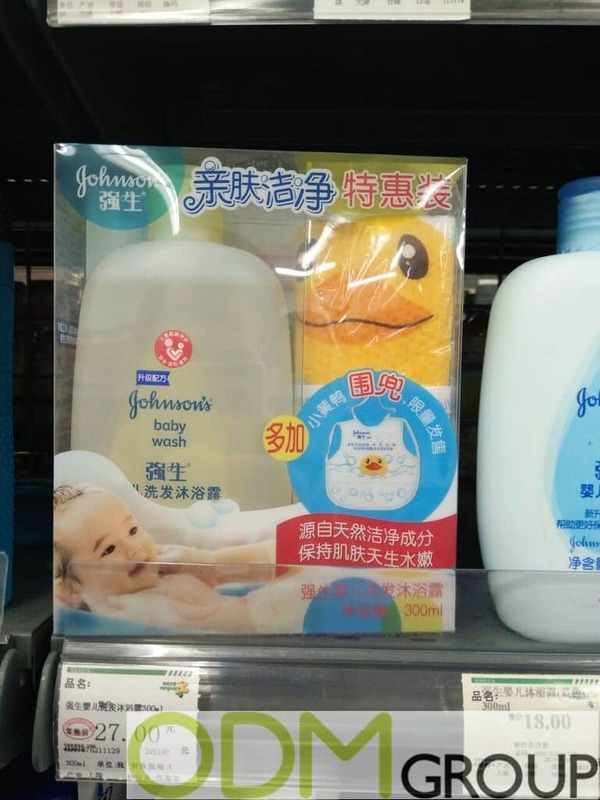 Johnson’s Baby, a brand of worldwide known Johnson & Johnson company, are currently offering a free gift with purchase. With every sale of their baby wash, you will receive a children’s bath toy as a promotional gift. In this blog, we will explain why such a marketing scheme can be of benefit to your business. 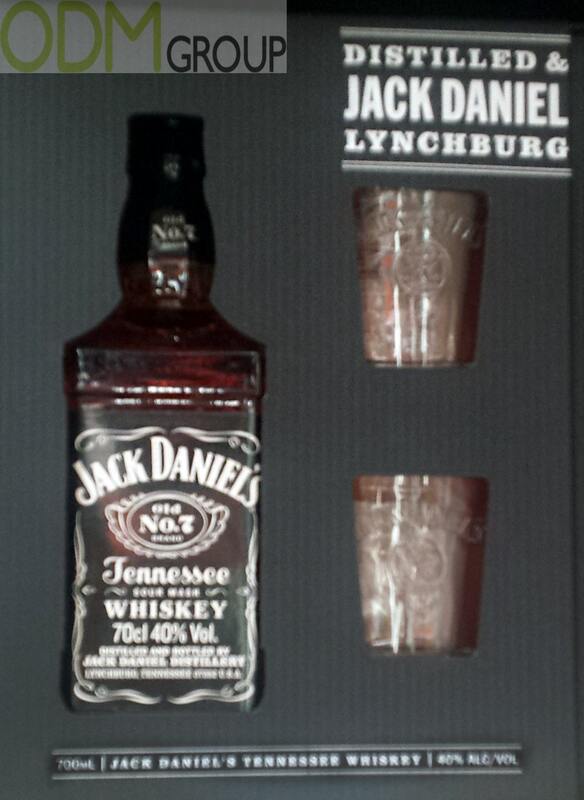 One of the world’s most famous Whiskey company’s, Jack Daniel’s, is currently offering a liquor promotional product. In this case, a leather satchel and a 200ml bottle of Gentleman Jack (a premium variation of Jack Daniel’s) are being offered as gift with purchases with every sale. Below we will discuss why this is another example of successful marketing effort on Jack Daniel’s part. 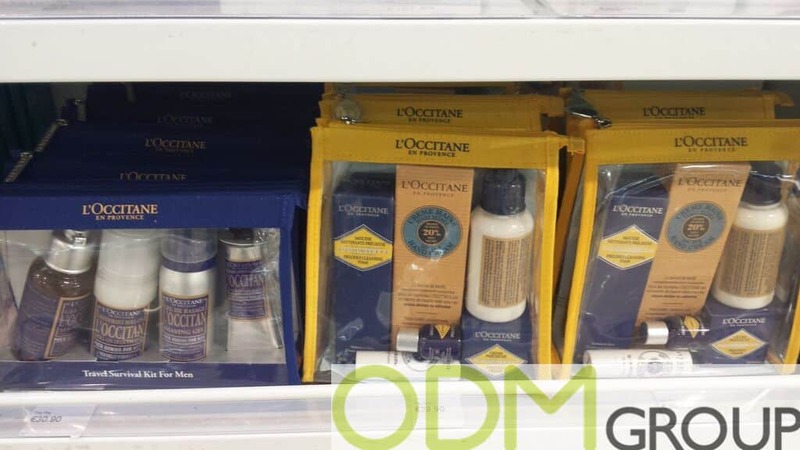 Renowned cosmetics brand L’Occitane are currently promoting a variety of on pack promos. This is a great example of a brand offering high quality gifts as an on pack promotion. On pack promotions are a great way to make your product stand out from others. Keep reading to find out why this type of marketing campaign can help you and your business develop. 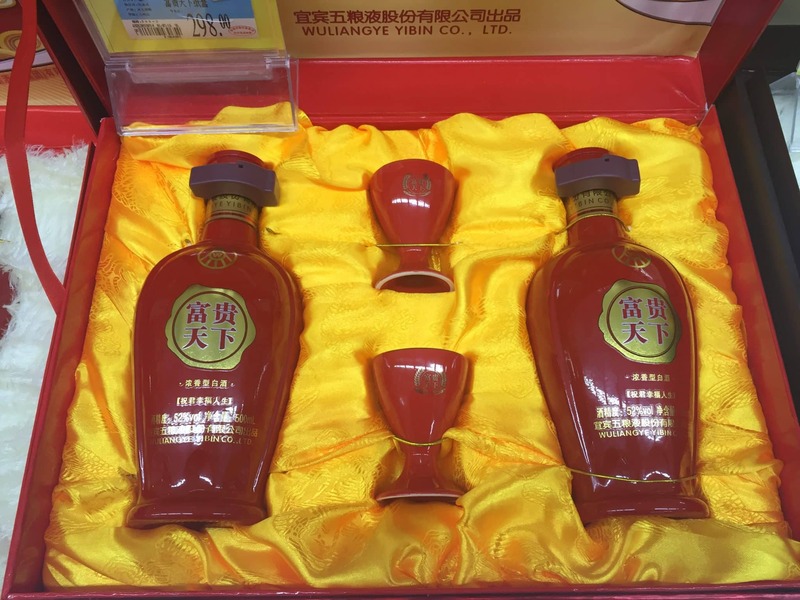 On display in Zhuhai, S. China, a Chinese drinks company is offering a free gift with purchase with their baijiu. This is a great example of marketing technique. Below we will explain why a promotional drinks coolzee can be effective. We will also advise on why a similar product such as this can help your business. Excellent promo gift set from New Zealand: free items by Kikki-K stationery store were available this holiday season in Shore City shopping center. The Promotional gifts themselves were so appealing, that you would have a hard time deciding whether to treat yourself or share them to someone you love. Jameson has produced numerous promotional items in the past, including branded flasks or promotional glasses for example. These have strongly contributed to its high brand awareness. But just because it is an established and well known brand, this does not not stop them from pushing promotional products all around the world. 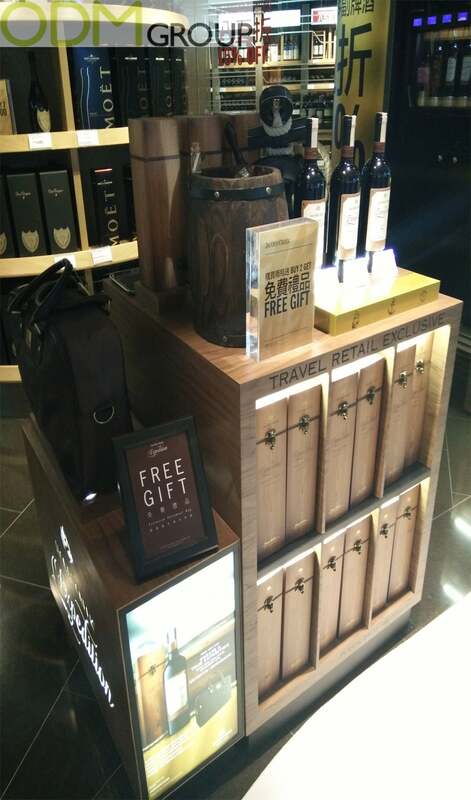 In this particular example on show in Guangzhou, S. China, Jameson are offering a free gift with purchase. 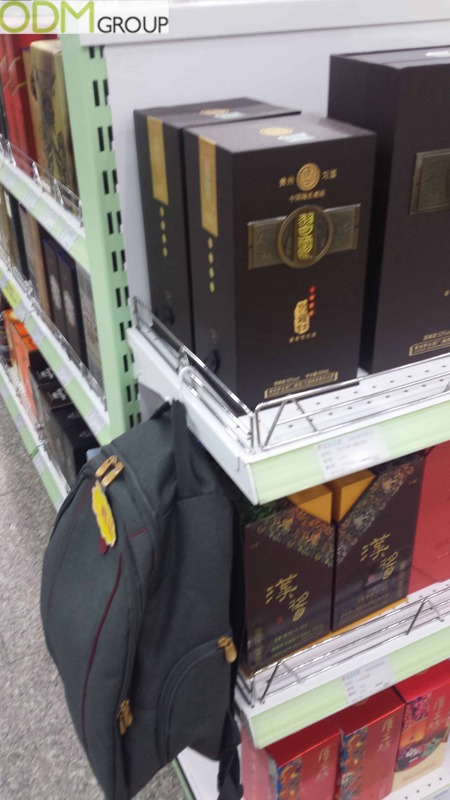 This over the shoulder bag may appear to be a simple concept, but below we will explain why this is another example of successful marketing effort on Jameson’s part. You may have noticed in the past that promotional bags, and in particular branded ones, are used by companies in order to boost the sales of their products. Perhaps coming as a free gift with purchase, or as a promotional idea, there are numerous reasons behind the thinking of utilising promotional bags. 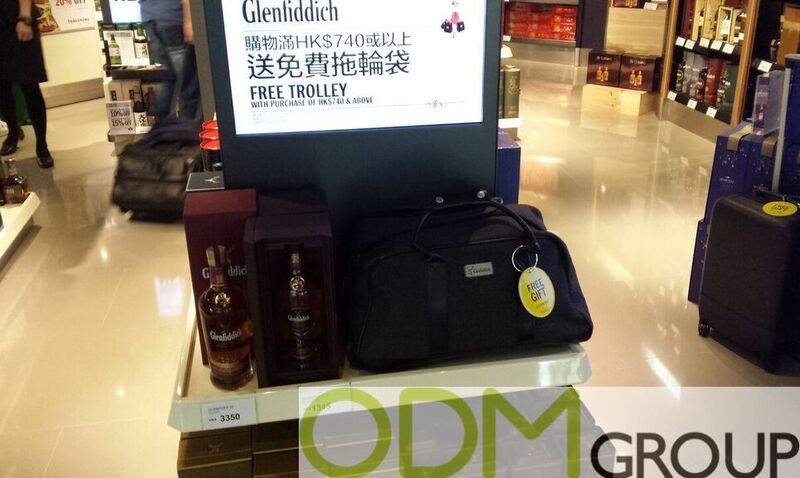 This example by the Guizhou Maotai Distillery on show at Hong Kong International Airport will serve as a great case study as to why, alongside its premium promotional casing to compliment it, a promotional bag can be of benefit to you and your product. The British-American cosmetic giants, are big advocates of promo gift giving. With the use of, tote bags, notebook sets and body-care hampers they are very experienced in the promotional products industry. 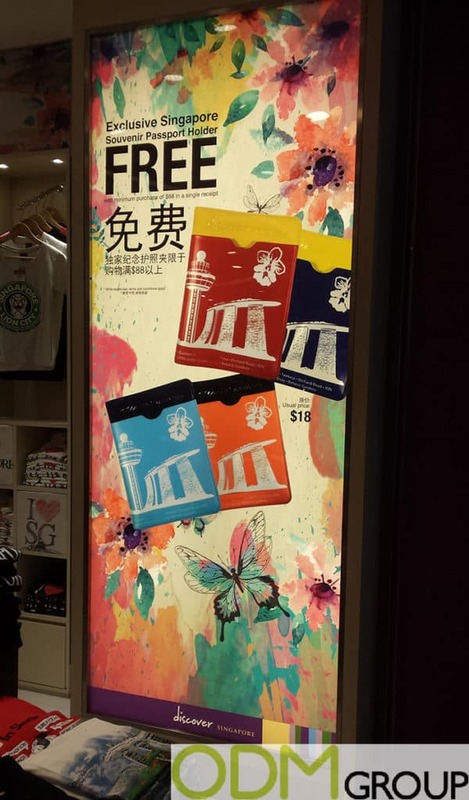 Here is one example though of the use of promotional towels, at Hong Kong international airport. Probably, the most appealing and luxury magazine promotions you can find in on-flight catalogues of major air companies. 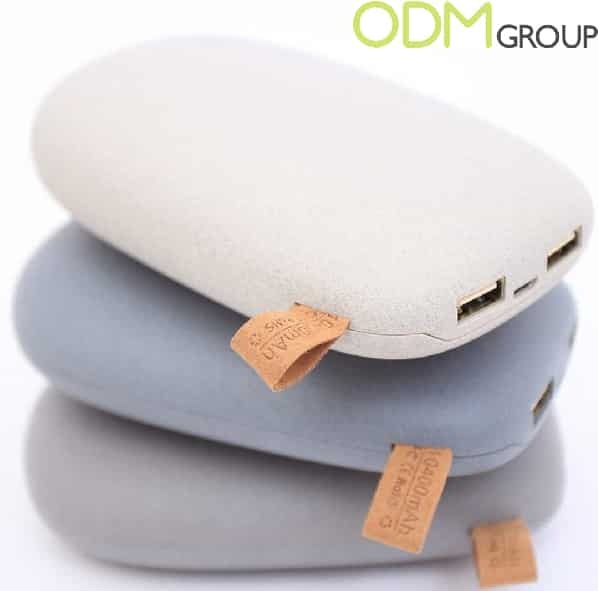 Cathay Pacific, the flag carrier of Hong Kong, is currently offering high-end USBs as gifts with purchase in a collaboration with a fashionable luggage brand Hartmann. 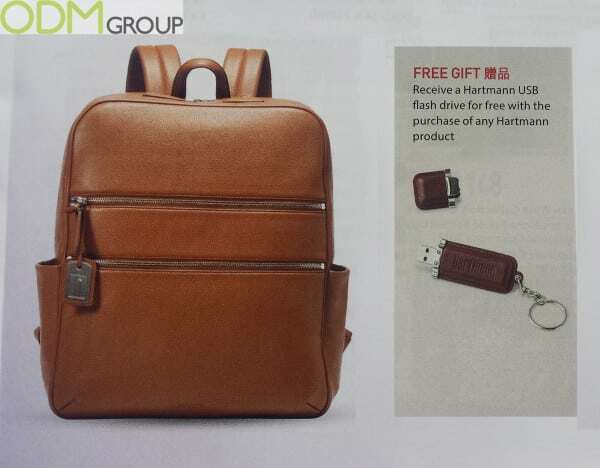 With the purchase of any Hartmann product, for example, this Liberian Backpack, on board of Cathay Pacific plane, you will receive a free customised USB flash drive with debossed Hartmann logo on it. The promotional item itself looks like a perfectly matching add-on to the backpack. Both items combine classic silhouettes and chic simplicity, flaunted the rich tones and natural texture of top-grain leather. Italian fashion company Furla are currently offering a free gift with purchase each time you buy a pair of their coveted sunglasses. 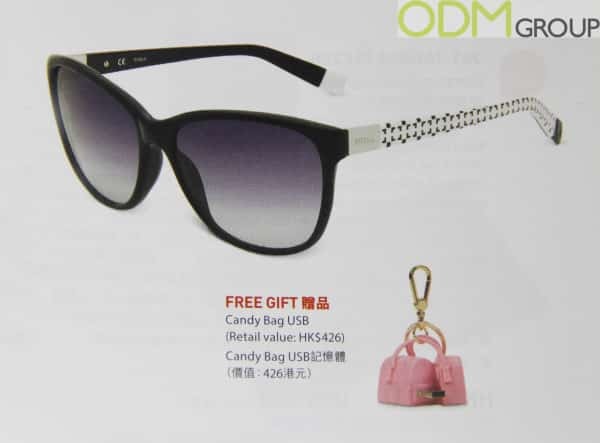 With each purchase from them, you will receive a candy bag USB included in the price as well as the sunglasses. A free gift with purchase can have favourable benefits on companies and brands, so click the link above to find out what these are. 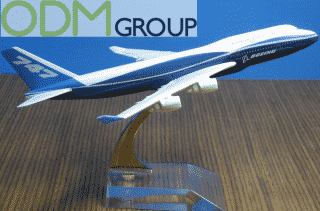 Travel promotional products are a great tool due to the nature of the products. Travel is a verb that rings the bells for marketers, the main reason because it encourages on-the-go use and is a great way to inspire conversation. 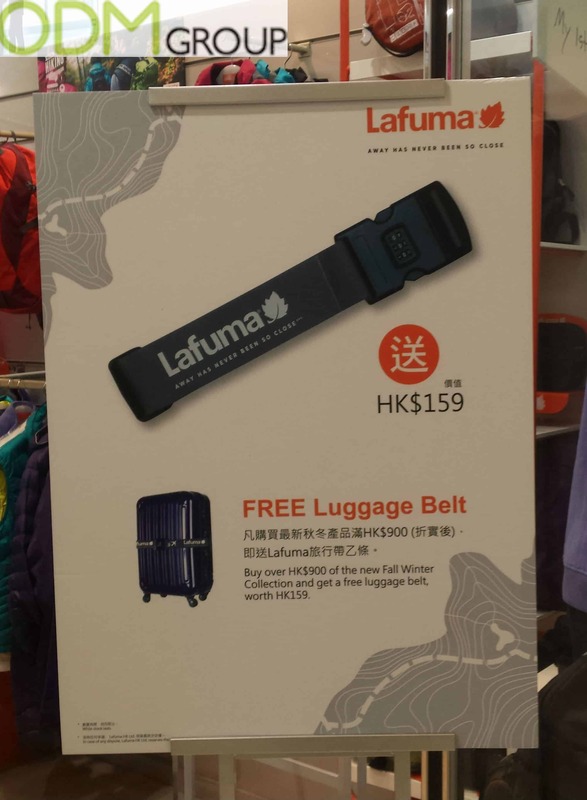 Outdoor equipment and luggage providers Lafuma, have opted to use a free customised luggage belt in order to provide motive for consumers to splash out HK $900 at selected retail stores in Hong Kong. Last year we gave out Aluminium Wallets packaged in Lai See packets for Chinese New Year. As much as we love magic (monkey magic), there is actually quite a lot of work that goes into planning our marketing campaigns. This year we are all about promotional socks. Now, as CNY factory closing dates are rapidly approaching, we are about to press the button on manufacturing promotional socks as our gift this Chinese New Year. If an event doesn’t end with a lantern send off, then its not one to remember. Here is a great event promo idea that can be used by anyone and everyone. Below though, is a fantastic example of how to make a great promotional product by Cambridge award winning Kate Lycett. 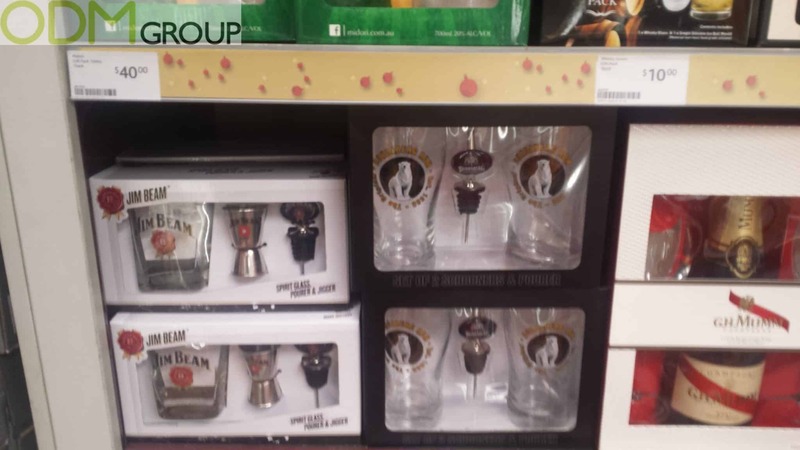 Liquorland, the pacific’s finest hub for all alcoholic needs, is where liquor promotional products take their centre stage. 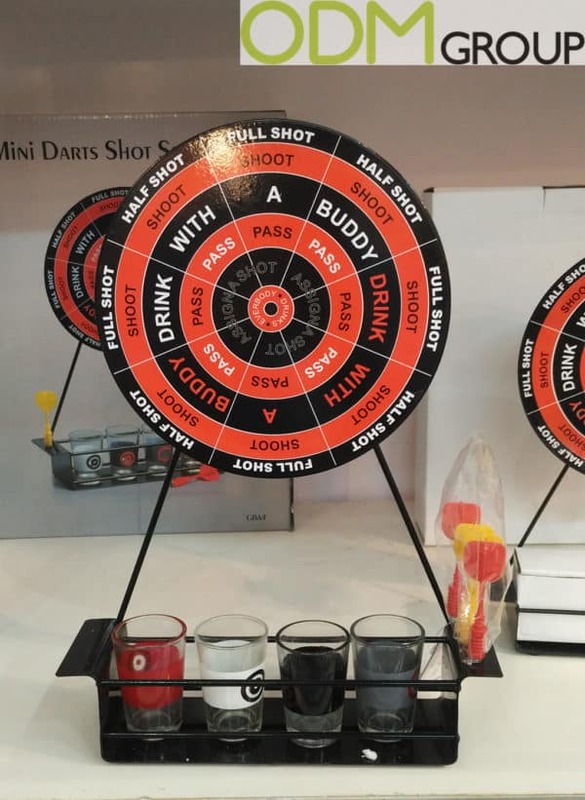 Here is a great example of a drinks promotion merged with a gift with purchase campaign, introduced by Liquorland in New Zealand in partnership with Australian beer brewers Coopers. A Promotional Gift is the best type of gift! Make it a limited edition one, and there is your success. 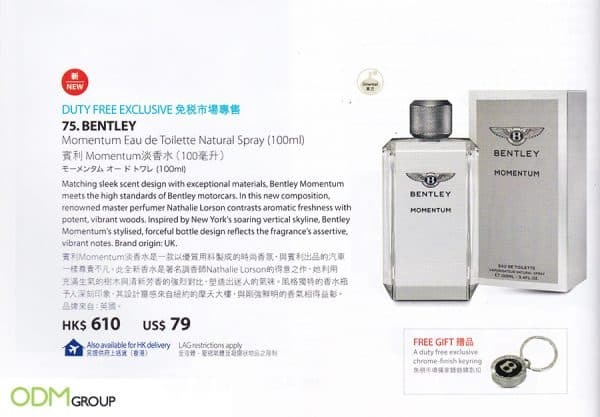 Here is a great example by Paul Lafayet, included in Cathay Pacific’s airline travel magazine, utilising a gift with purchase campaign. 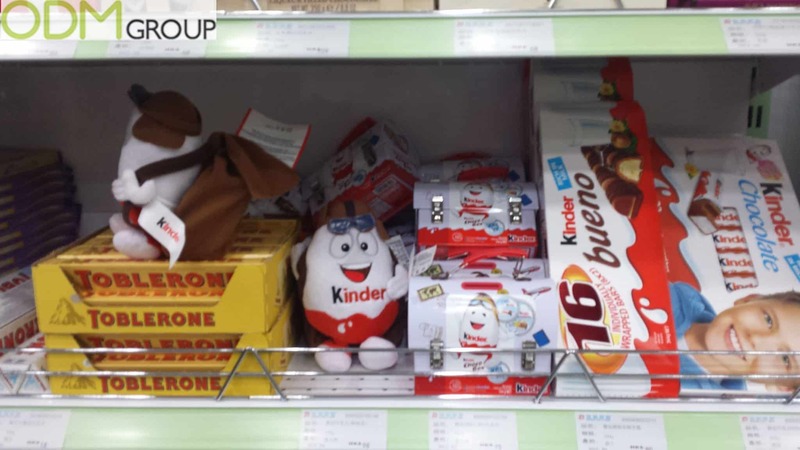 Confectionery giants Kinder have employed gift with purchase ever since the 1974 kinder surprise launch. Here is a great example of a current gift with purchase campaign advocated by the firm. Kinder justly advocate their brand image and mascot via the use of these promotional products, furthering the high levels of brand recognition that Kinder already behold. They opt to use promotional figurines and also include collector tins in order to add value to their product. 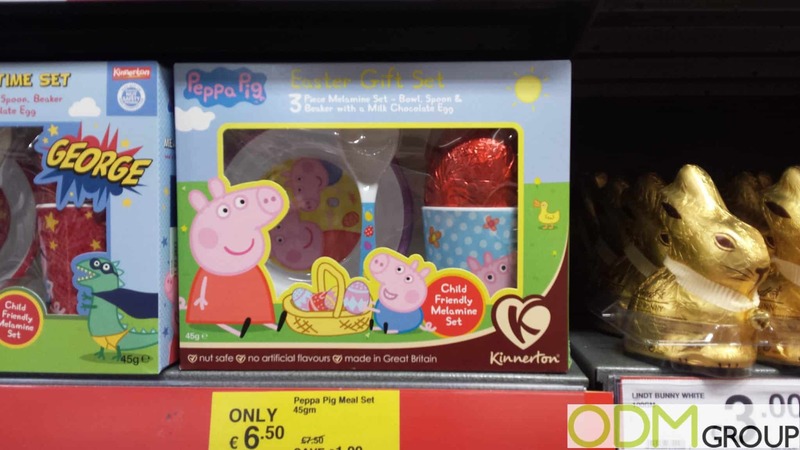 The gifts are cleverly worked to focus on their target audience of children, whilst offering products of top quality. As we have seen previously promotional mugs can be a very useful tool when implementing any kind of marketing campaign. 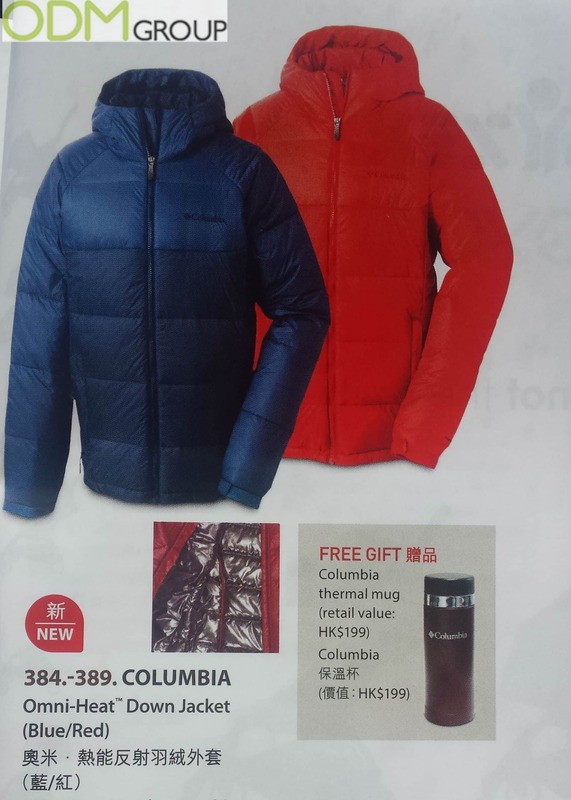 This free gift with purchase by Columbia is a great example of how to execute a promotion efficiently. Brand managers and marketing managers alike are satiating their reflection this time of year. As the festive season comes to an end, budgets are bulging from marketing departments to welcome the new year. Its essential to reflect on the consuming season and plan ahead! 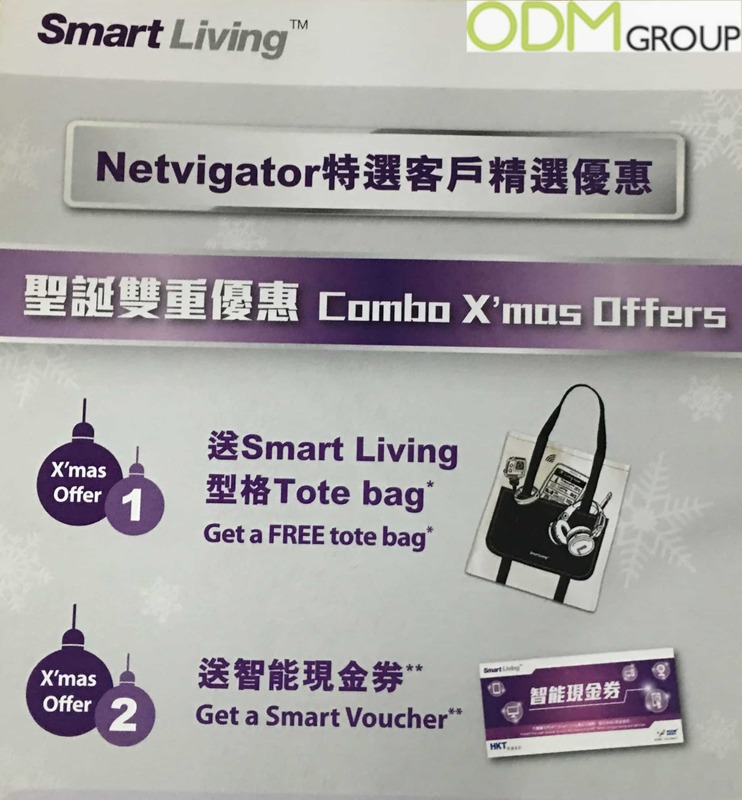 Here is a great example of a gift with purchase campaign employed by Smart Living, cleverly slotted into Cathay Pacific’s airline magazine. Hennessy claim to be and are considered by many as the worlds finest producers of cognac. 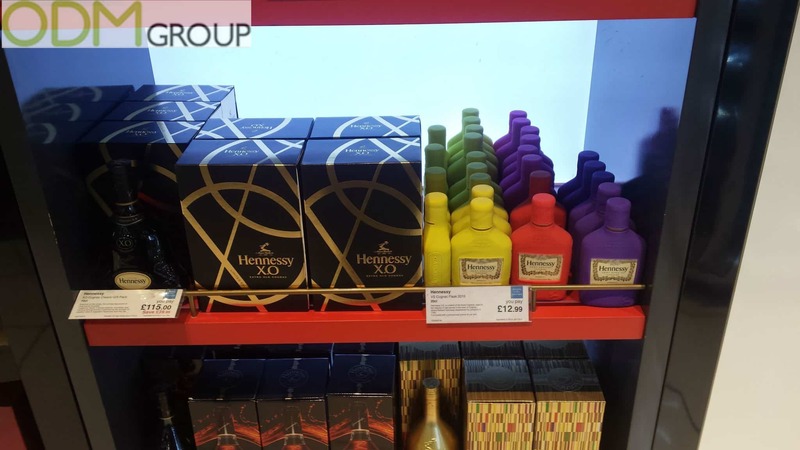 Here is a great example of one of their recent drinks promo campaigns, including a rubber flask with selected bottle types, and on show at Heathrow’s various Duty Free stores. Liquor promotional products are often premium. From branded ice buckets and stirrers to successful packaging there have been great items for this industry. 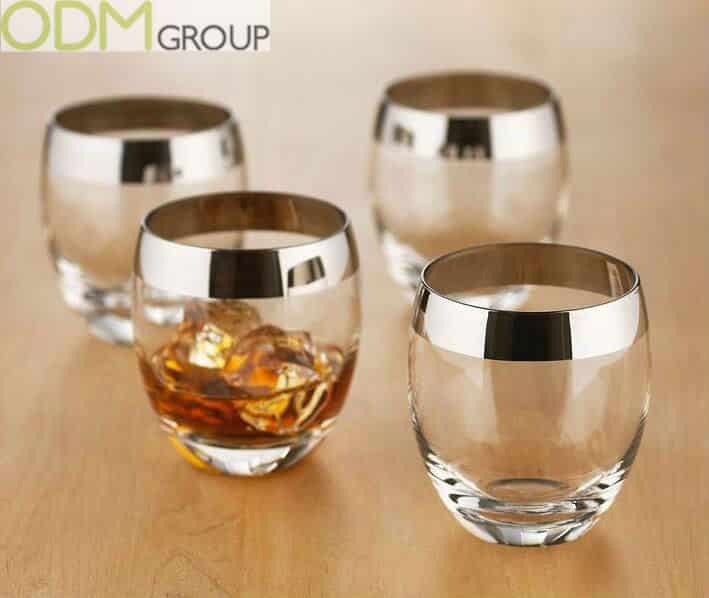 This trend is the same here with these promotional whiskey glasses, the metallic rim adds a premium accent while the strong branding ensures exposure. 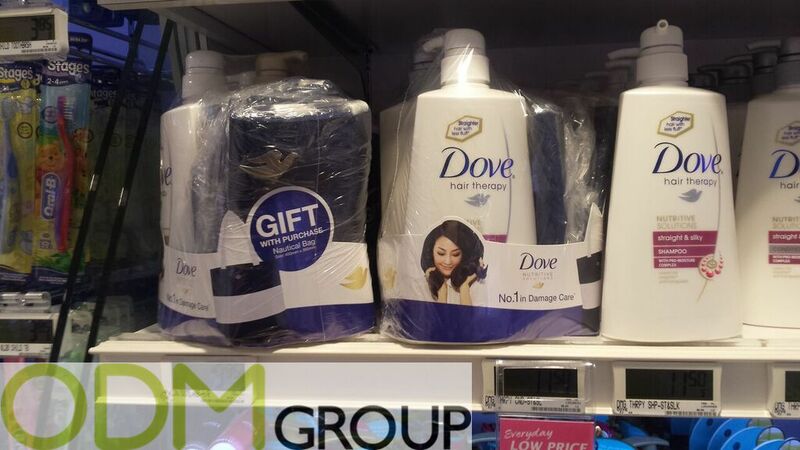 Today’s case about POS display free gift promotional campaign by Nestle is all about marketing with love. 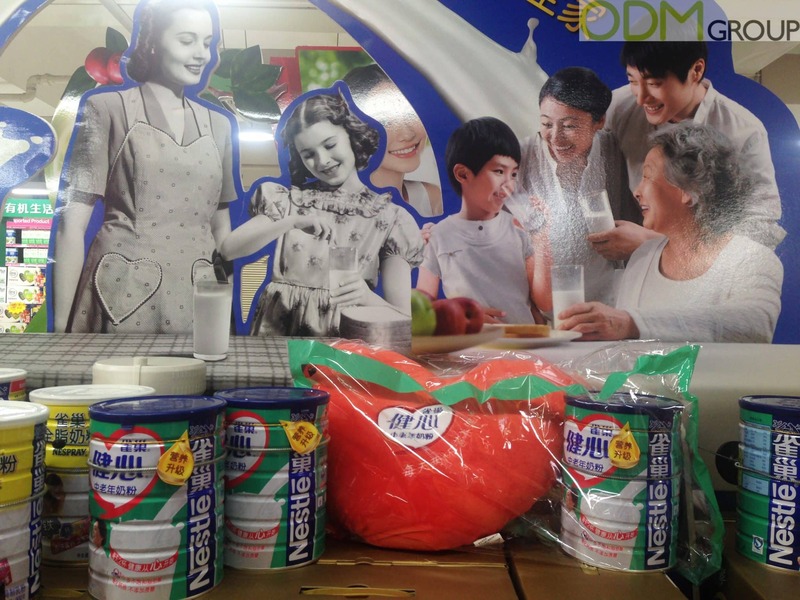 Currently in China, in Carrefour chain of hypermarkets, this transnational brand is offering a gift with purchase of the big jar of their powder milk – a coral heart-shaped pillow. Nestle is a transnational food and beverage company based in Switzerland. It is the largest food company in the world measured by revenues. 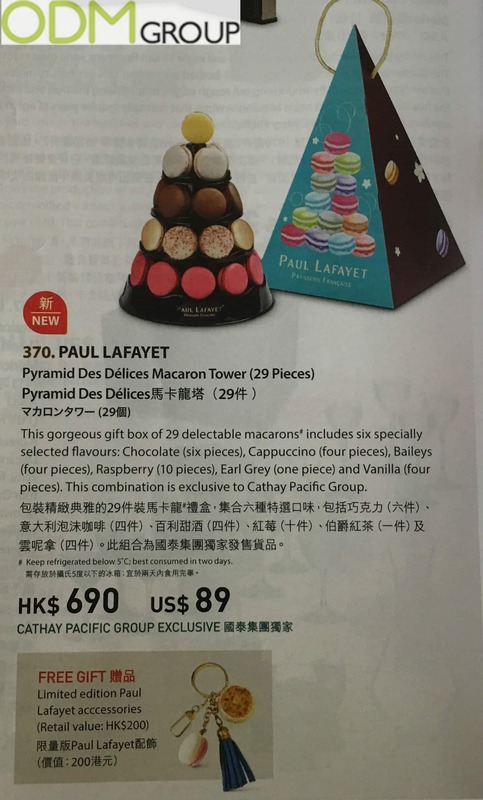 Here we have a fantastic example of a prosecco promo campaign exclusive to Cathay Pacific and promoted through their magazine. The gift on offer is enrolled as a Bottega Jeroboam Ice Bucket and not only does it look incredibly stylish and premium quality but is a product that holds use. 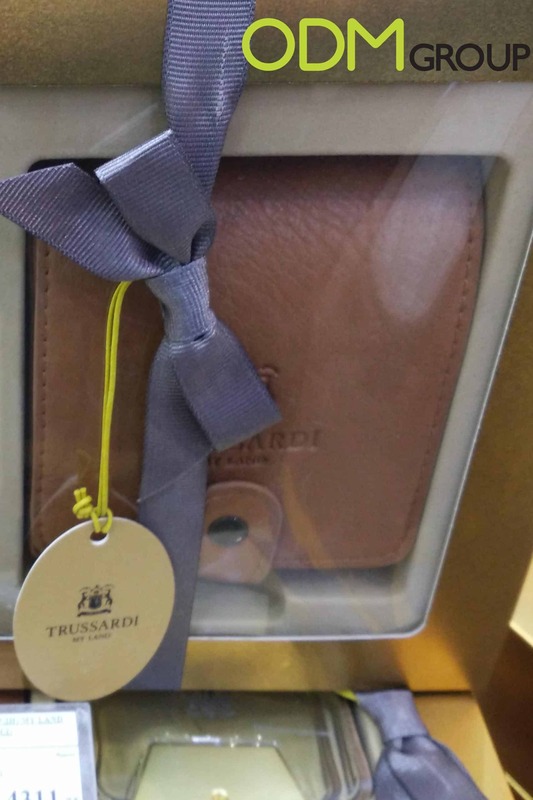 Trussardi is currently holding a promotion in Russia – for a purchase of Trussardi cologne you get either a branded leather wallet or or high-end leather phone case in a free gift set. New Year holiday time is a peak season for all beauty and perfume shops and big brands has prepared amazing promotions. Perfume comes in a lovely gift box with a branded leather wallet or leather phone case. 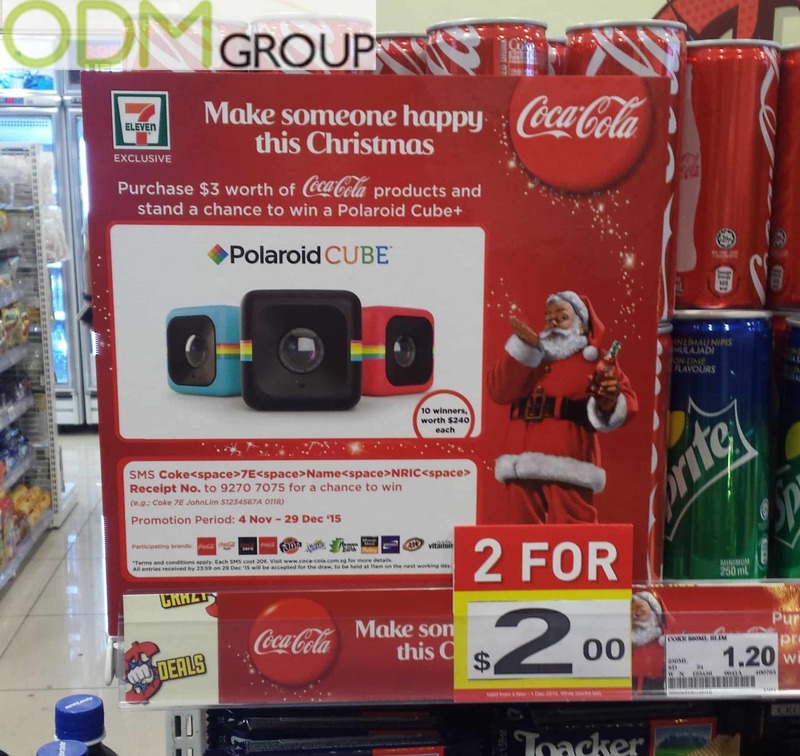 Here we have a superb example of a promotional give away by a formidable team of giants Coca Cola and Polaroid. Promotional bags are used habitually with all types of brands due to the all-encompassing nature of the product. 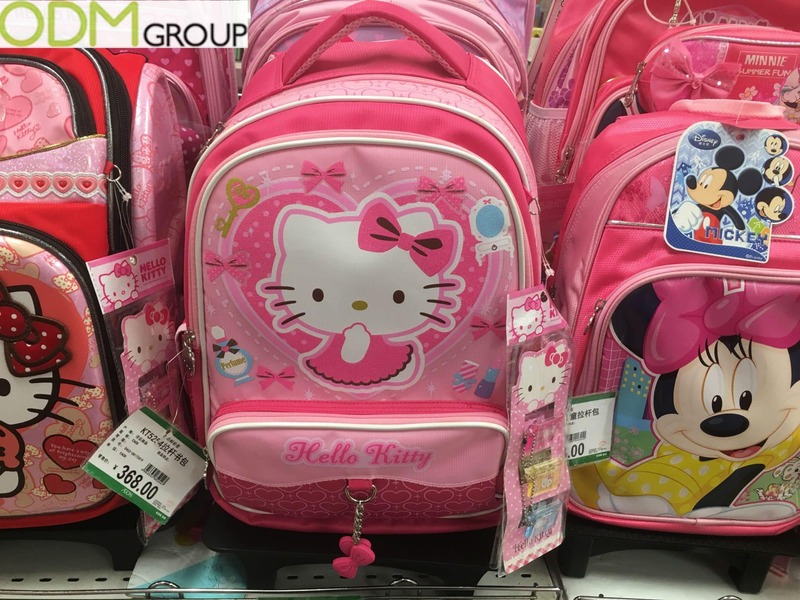 Although, this particular blog focus will be on Hello Kittys use of promotional gifts, included with this bag purchase. ODM is delighted to announce the latest edition to our product portfolio to be this incredibly stylish, premium quality and impeccably brandable Conference Tote Bag. These conference tote bags are the perfect promotional product for whatever industry your brand belongs to and here’s why. Who doesn’t like a free gift? Overland are offering free premium bags worth $100 for any customer who wants to splash out $280 or more at any one of their selected New Zealand retail stores. Encouraging additional expenditure with the use of premium gift with purchase is something we at ODM have seen many a time. Though, this particular promotional expedite offers a little more finesse than some others in the past. 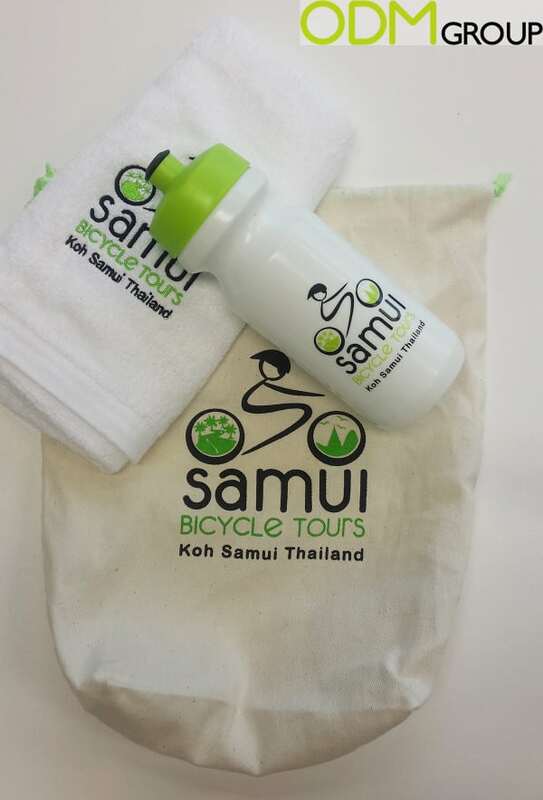 Admirable promotional merchandise by Samui Bicycle Tours is a great example of using marketing gifts for brand exposure. Based in Thailand, the company is offering a magnificent opportunity to explore the beautiful island of Samui with half-day bike tours suitable for all experience levels. A free tour pack includes a set of high quality items, drink bottle, towel and organic cotton drawstring bag – all offered as free gifts with purchase of the tour. The brilliant marketing idea, as all of the products can be used immediately during the ride. 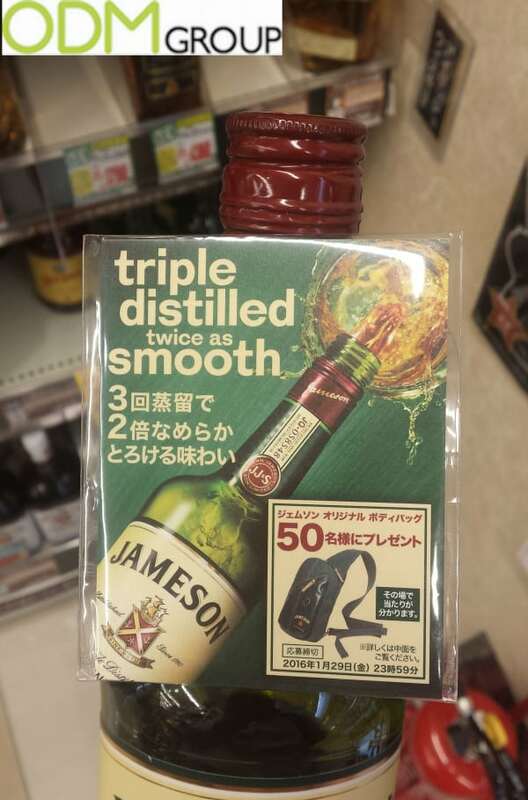 In this particular example on show in Guangzhou, S. China, Jameson are offering a free gift with purchase. Click the link above and read why this is another example of successful marketing effort on Jameson’s part. The Body shop, cosmetics and health based retailer, has used the classic gift with purchase to drive sales and promote their brand. 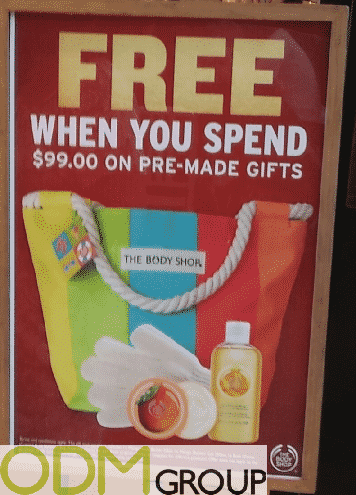 By using their marketing budget on promotional products such as these bags, they are exposing the body shop brand. But the benefits do not end here. 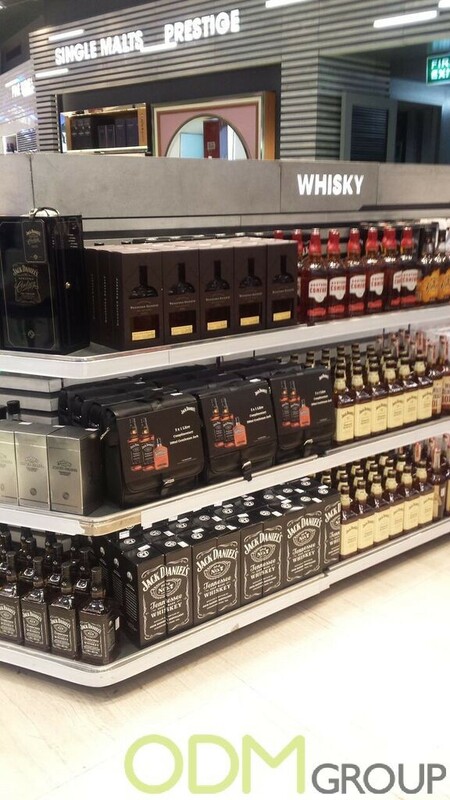 One of the world’s most famous Whiskey company’s, Jack Daniel’s, is currently offering a liquor promotional product. In this case, a leather satchel and a 200ml bottle of Gentleman Jack (a premium variation of Jack Daniel’s) are being offered as gift with purchases with every sale. Click the link above and see why this is another example of successful marketing effort on Jack Daniel’s part. 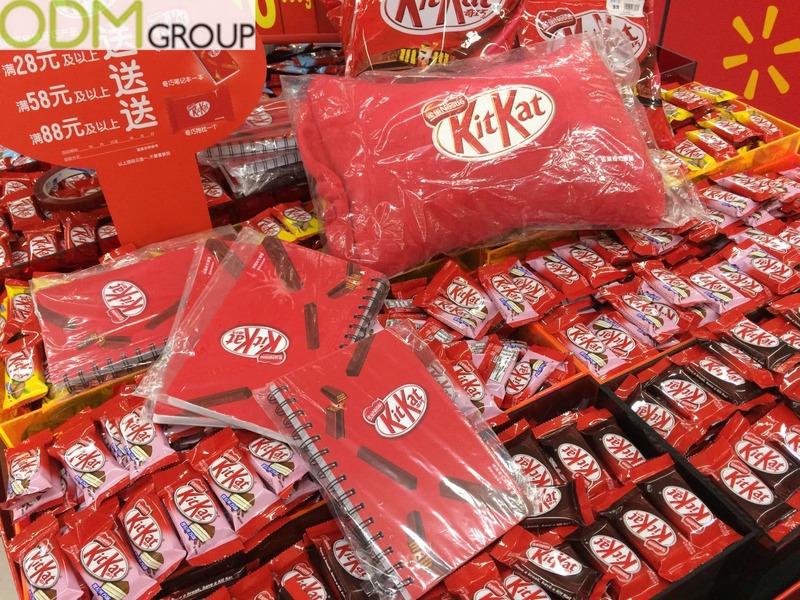 A world famous confectionary brand KitKat is currently offering a pleasant gift with purchase in multiple stores and supermarkets in Singapore: a nice London Travel Pouch, made in the combination of recognisable KitKat trademark style and national British red-blue-white colours. This case can be called not a typical gift with purchase, but purchase in the gift! You can find 12 KitKat biscuits inside this small bag. Perfect present for the ones who loves travelling! Tired of typical promotional t-shirts, pens, and notebooks? 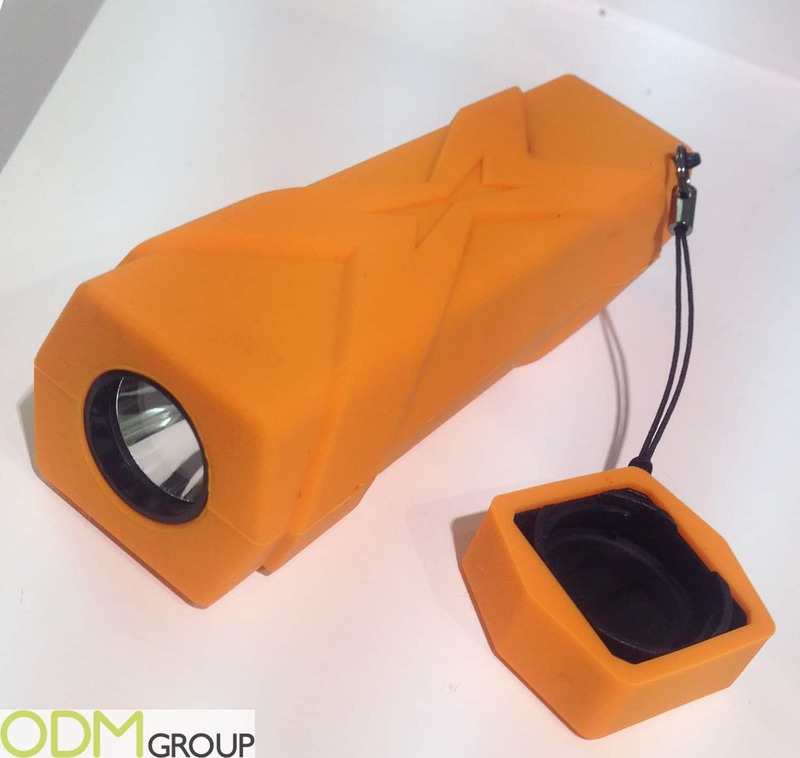 Think about an innovative and unique idea: promotional USB lights as customized product! These handy and unusual marketing items represent the perfect gift for your employees and clients, and they will for sure call a great deal of interest and attract much attention to your brand. In anticipation of the upcoming new episode, Star Wars fewer seems to have swept the whole world. Numerous promotional giveaways, creative marketing campaigns, catchy posters and advertisements will not let you escape from this epic space saga. 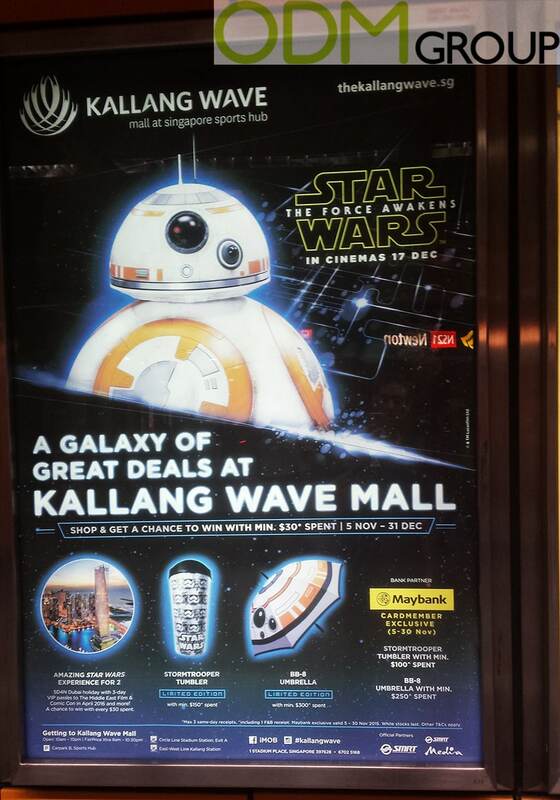 In partnership with Disney’s Southeast Asia department, Kallang Wave Mall, based in Singapore, has announced the campaign for promotional giveaways, dedicated to the highly-anticipated episode. For the purchase over 30$, any customer can win the following prizes: an amazing holiday in Dubai together with the entrance ticket to Comic Con 2016, a cool refill tumbler for coffee and tea, printed with Star Wars’ characters Stormtroopers (if more than $100 spent), or an exclusive BB-8 droid printed umbrella (minimum $250 purchase). The campaign is taking place from November 5 till December 31. 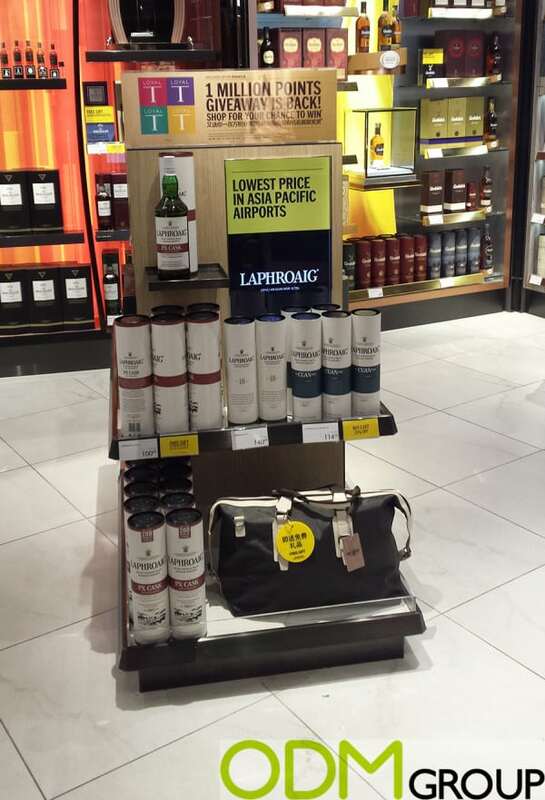 The prestigious alcohol brands are giving away no less than a prestigious bag, perfect for traveling and using as hand luggage. This gift with purchase example is mainly effective due to the type of gift they’re offering. As the product is high end, the gift also must be of high quality to attract effectively the right consumer to the product. 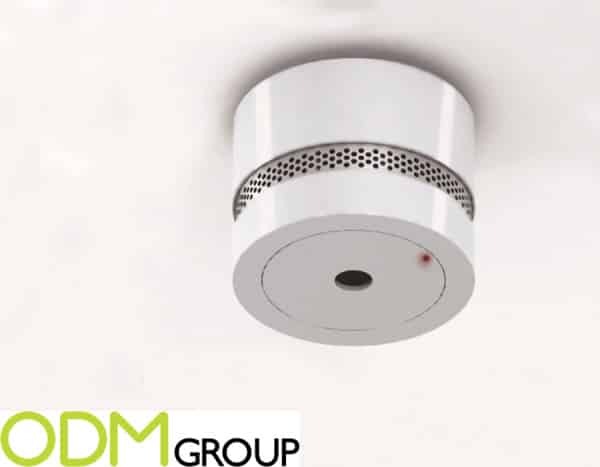 Show the customers your concern about their health, life and well-being – choose Mini Smoke Alarm for your promotional campaign or offer as a gift with purchase. Perfect for Tobacco industry – Philip Morris International, British American Tobacco and Japan Tobacco Inc. should definitely consider this idea in their future marketing campaigns. 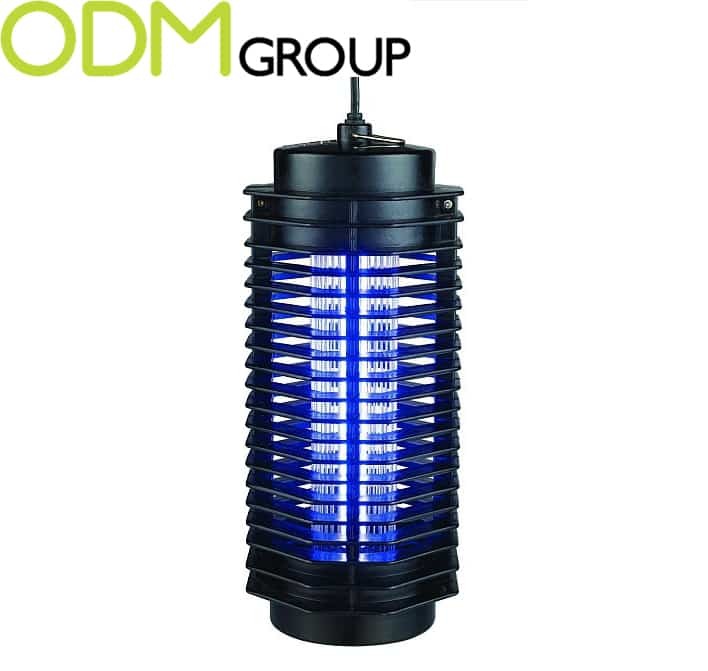 Ingenious promotional idea for gas stations, convenience and hardware stores – the Electronic Anti-Insect Devices, such as the Electronic Insect Killer and the Mosquito Repeller Light, which are perfect for using as marketing gifts. The future is here and once again it comes directly from the past. 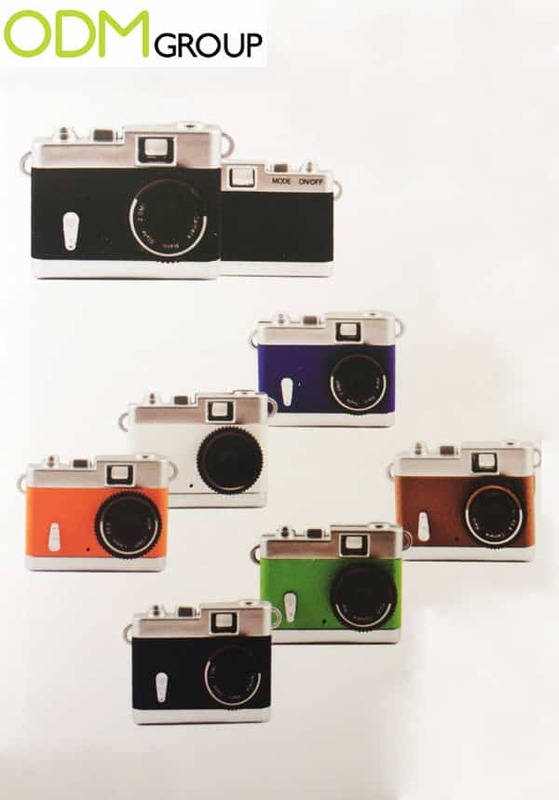 Presented as a gift with purchase option or on pack promotion, this miniature looking version of an old Leica will win your customers’ hearts. Shipping merchandise comes in a vast variety of forms, from shipping container tissue boxes to branded umbrellas. The possibilities for promotional products are an endless pool of potential for brand awareness. Custom shipping merchandise is even more interesting. It is memorable for those using it, bringing brand activation, and makes for a great gift to your employees. This broadcasts your brand, bringing omnipresence both in and outside the office. Jerseys and T-shirts are among the most popular promotional products used for brand activation, but not the least effective. Due to how applicable they are to the everyday person, they can serve as one of the best ways to increase popularity of your brand. 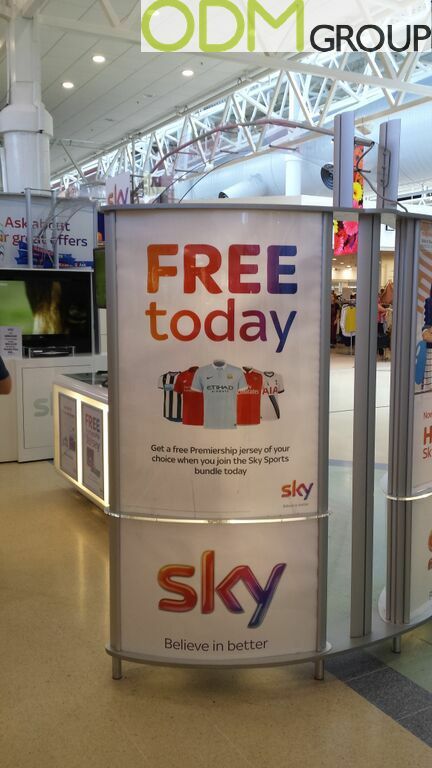 Sky sports strategy to give a gift of a Premier jersey upon joining its bundle was a perfect marketing decision. 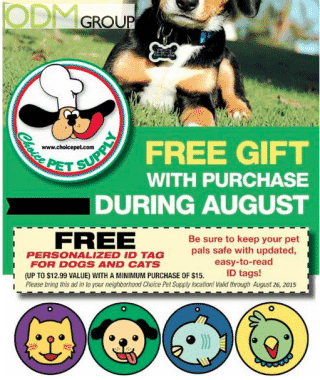 Choicepet.com was taking using ID-pet tags as a free gift with purchase as their main advertising product. To receive this gift, customers needed to spend more than $15 in their online shop during August 2015. By offering personalized tags, they motivated the customer to purchase while advertising the Choice pets brand name. Creative and different promotional items create more attention to your brand, these Pet-tags are a great and different way to brand your logo. 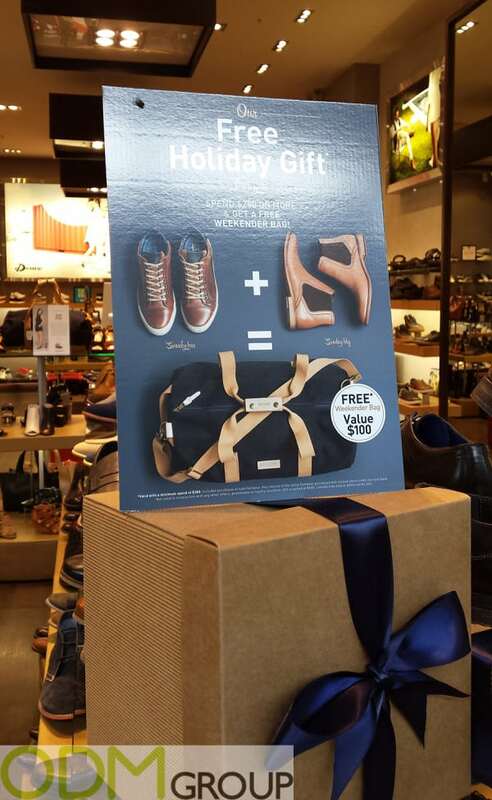 For Singapore’s 50th Birthday, Tiger were running a promotional campaign offering a free gift with purchase. By using this campaign, Tiger know it’s a great way to increase sales. It’s well known that gifts with purchase add extra incentive for consumers to purchase your products. 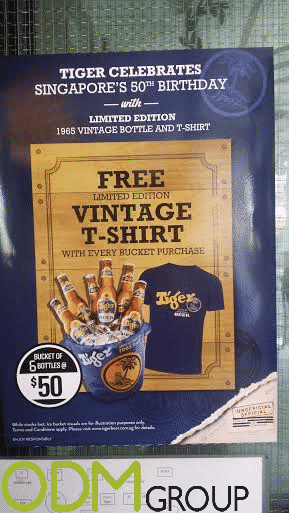 The branded Tiger Beer T-Shirt will be used in public places, which offers a great opportunity for Tiger to get their brand out there and increase awareness of their beer. The same can be said for the other items they’re offering. 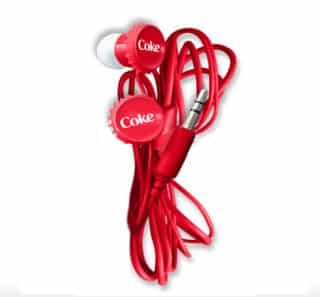 The general marketing strategy for Coca Cola has always been to give customers highly visible, branded gifts – as you can see from the eye-catching promotional earphones. The selling point of this promotion was the uniquely designed ear buds, which are shaped like bottle caps and branded with the Coca Cola logo. 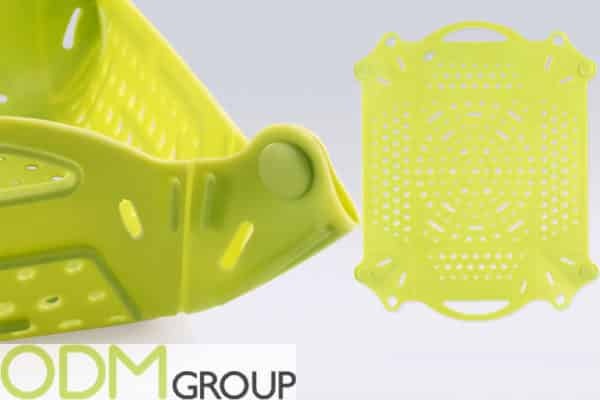 The bright color and unique, innovative shape will make them extremely attractive to consumers. So these aspects together make it more likely that consumers will purchase Coca Cola drinks, in order to get the promotional earphones. The magazine Cosmopolitan recently started such a campaign with a gift with purchase by offering a free travel pillow. Upon first impression, the only benefit seems to be the increasing sale numbers of the magazine. However, there are many additional benefits for Cosmopolitan than just an increased turnover. The offer of the travel pillow as gift with purchase itself will increase product recognition and brand awareness. 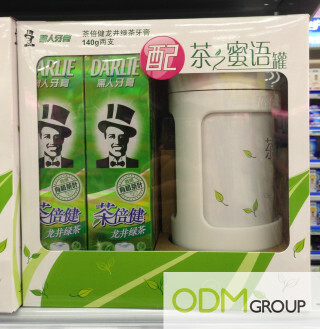 Many Chinese companies offer gift with purchase, Darlie is one of these, offering a tea mug as a gift with purchase. The toothpaste to be purchased in order to receive the gift is toothpaste that is enriched with tea leaves. This makes the tea mug a suitable gift with the purchase of a specific product. Having a gift that is complementary to the product makes the gift with purchase attractive. 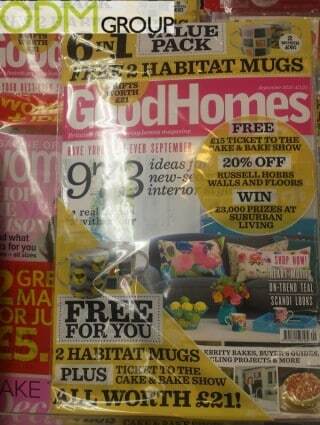 GoodHomes promotes their magazine with a free gift with purchase. The GWP mug from GoodHomes is a wonderful example of the black box model. GoodHomes inject a stimulus with their free mugs and will get the response by an increasing sales volume. 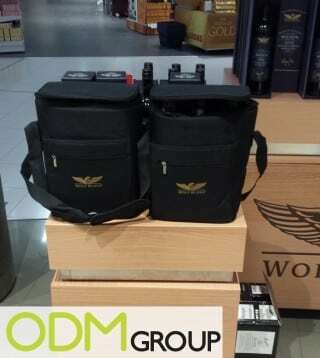 This exclusive gift with purchase bag from Wolf Blass is a good example of how promotional products can be used to incentivize customers to purchase. The alcohol industry often have interesting promotions and giveaways and this one is no exception. Offering a free bag with purchase, such as this one, is a great way of making people more interested in your products – thus increasing sales. 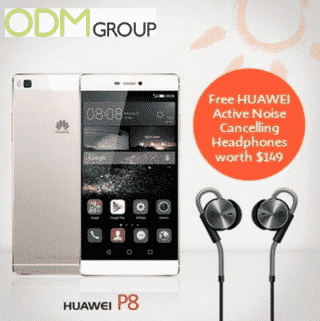 Huawei, is offering headphones to promote their new Huawei P8. When offering a GWP, you should consider if your free gift with purchase is consistent to the quality of your brand. These gifts share the same brand existence and are therefore a perfect match. 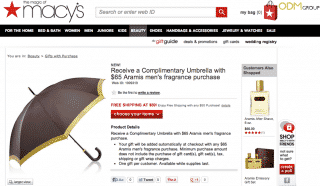 Aramis is currently offering a posh umbrella as a gift with purchase when you purchase any $65 Aramis fragrance from Macys. 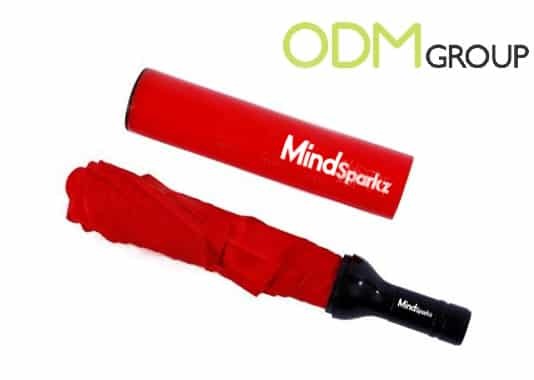 Umbrellas are excellent products to offer as marketing gifts, as they are very useful and can be used by your customers regardless of the weather. Alongside this, umbrellas have fantastic large surface area for branding. This provides you with an amazing opportunity to promote your company, brand and products through your gift with purchase. Macy’s is currently offering a gift with purchase. A set which includes a cosmetic bag is complimentary with a purchase of $35 of Philosophy products. Purchase gifts helps to improve brand recollection. The promotion would leave an impact on your customers. This helps them to be able to recall your brand over other brands when the situation requires them to. 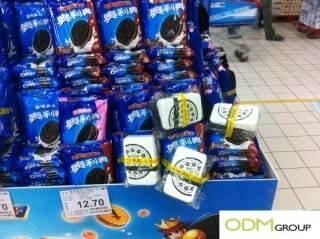 Oreo, one of the most famous and loved biscuits, is currently offering a gift with purchase at Carrefour in China. This offer will encourage potential customers to purchase items. The tote bag offered is attached to the packaging which should incentivize customers to choose Oreo’s brand over competitors. For a product that is in a competitive market, giving a gift with purchase could be the token to set it apart from its competitors. Donna Hay is an online shop based in Australia and they are giving away their gift hamper with purchase of their products. This gift with purchase is only available with purchase of any Le Creuset product. A gift with purchase helps to boost sales as customers are much more likely to purchase your products if there is a free gift offered. With your logo branded on the free gift, it will act as an advertisement tool for other people to notice your brand when your customers use your free gift in public. 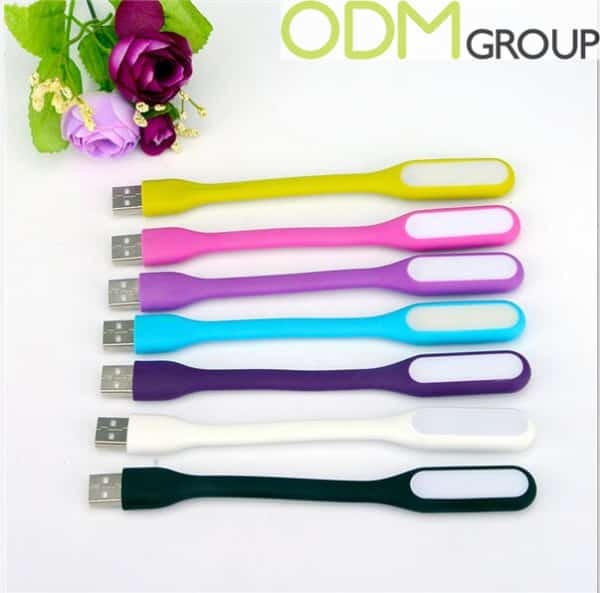 First of all it increases your market share if you choose the right promotional product within your marketing campaign. Along with this, when consumers use your product in public your brand recognition and awareness will increase. Finally customer loyalty is fostered. When customers receive the gift, they will have a positive impression of your company. This encourages them to continue purchasing your products and long term customer retention. A free gift with purchase would help to increase your base of loyal customers. 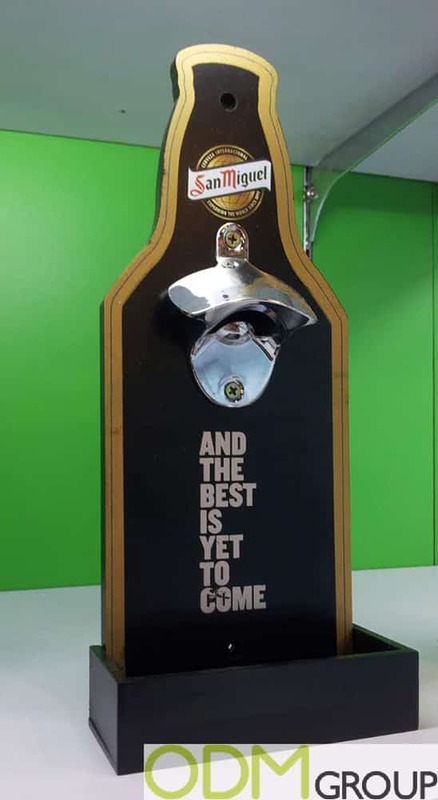 Sommersby Cider presented by the Danish brewing company Carlsberg Group is now offering a free gift with purchase for everyone who purchase a Sommersby apple cider. The free gift contains of an 8 in 1 party cooking kit, which provides different functions. 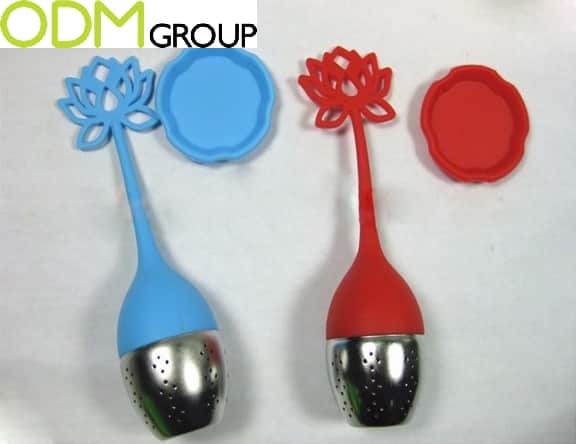 A few of the innovative functions are: A Lemon squeezer, spice grater, egg masher, cap opener and many more functions. 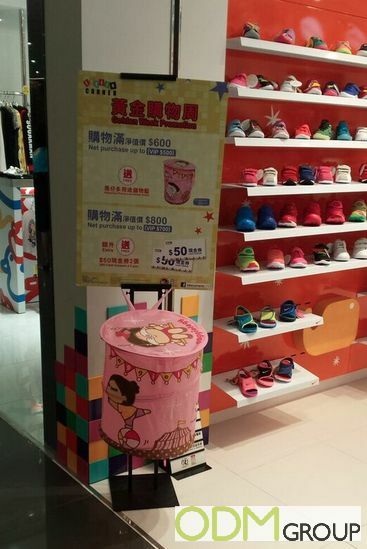 A well known kids shoe store in Hong Kong does now offer a free gift with purchase for customers who purchase for more than HKD 600 and above. The free gift is a branded storage bag, which contains of multiple functions, what includes, a laundry bag, a storage bag and a shoe bag. 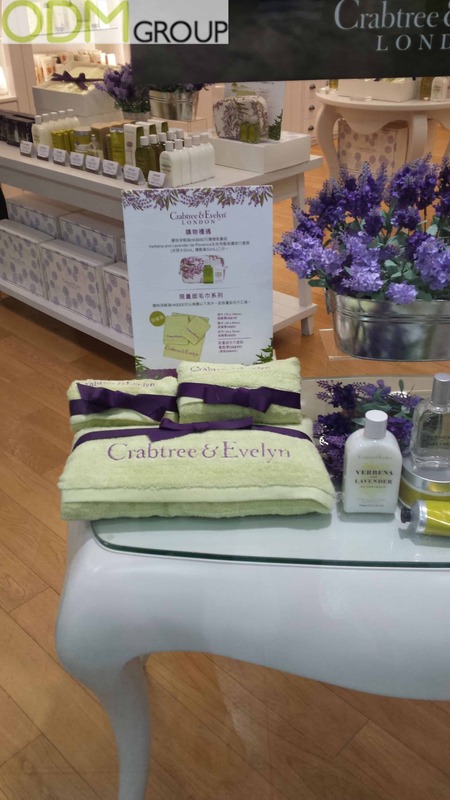 Also if people purchase from HKD 800 and above, they will receive two free vouchers. It have a total value of HKD 100. The Hong Kong and China mainland based financial institution, The Bank of East Asia (BEA) is now offering several of promotional products to customers who apply for a credit card of BEA. 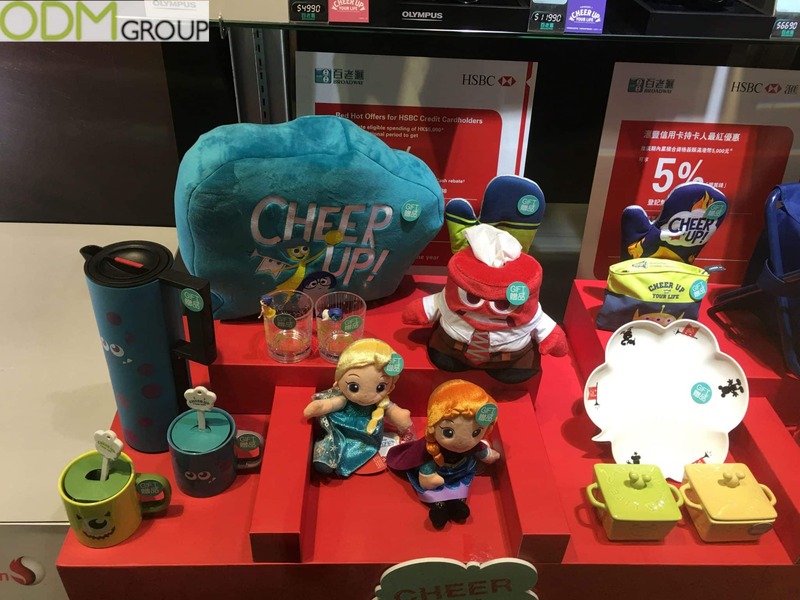 Promotional product has turned out to be a good marketing approach since the bank has become the largest bank in Hong Kong during the past years. The marketing campaign from BEA is seen as an advance premium. This is a premium given to new customers, as on condition they will earn it by later purchases. Customers can chose between 6 different kinds of promotional products as their reward. 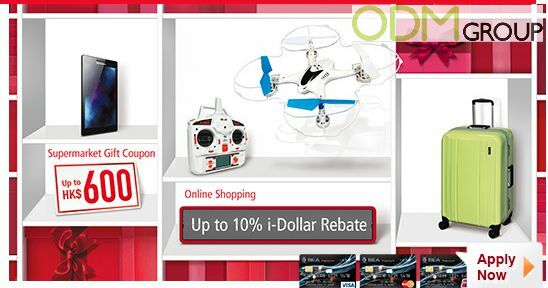 The products are: A Hithot real-time aerial vehicle, a Lenovo 7 inches tablet, a Hideo Wakamatsu 25 inches suitcase and 3 different coupons and vouchers to various of online shopping sites. Promotional rubber ducks since the introduction of ”Rubber Duckie” sang by Ernie on Sesame Street all those years ago, the rise of popularity for rubber ducks has shifted from it’s recognition of being a symbol of childhood, showers and bathrooms as well an important tool for cognitive development to becoming a promotional item favoured by adults. 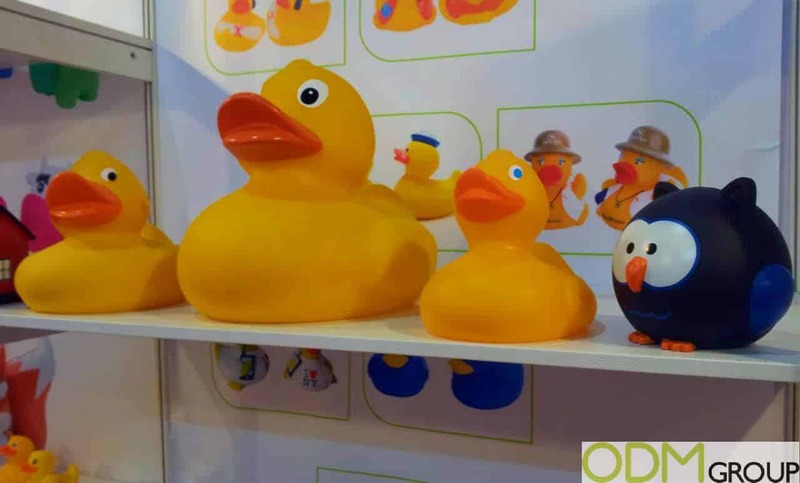 Adults have discovered many creative uses for rubber ducks including artwork, parody, sports connections, retail business names, clothing and fundraising duck themed races. 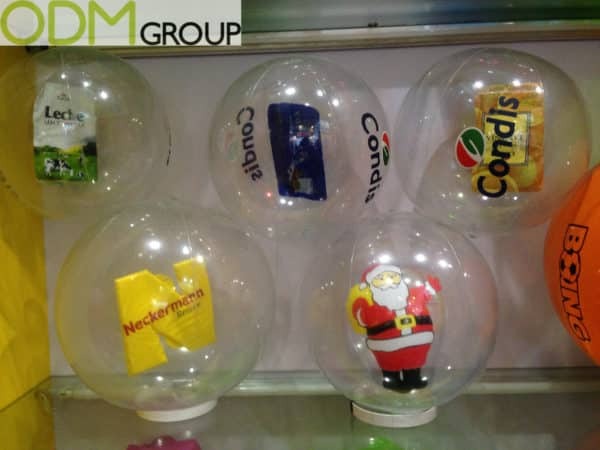 Making promotional rubber ducks a great idea to marketing your brand and induce fun into your campaign. The heat is rising as summer fast approaches and all kinds of promotional marketing gifts such as fans, are one of the first products to be used. 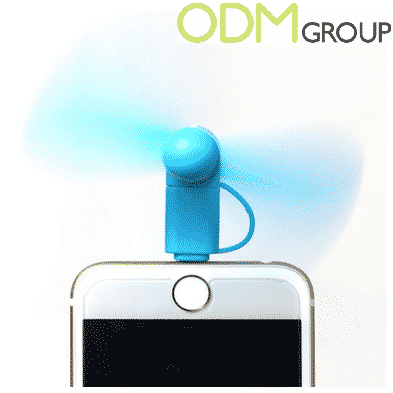 Mobile fans are brilliant marketing gifts ideas because they are used very often, and that is why mobile powered fans that can be plugged into your devices make very practical items to promote especially as free purchase gifts. nflatable furniture especially inflatable chairs come in all kinds these days and are popular gifts to give with purchases, and for smaller inflatables as covermount gifts, and offering them as a promotional item or gift, will for sure give your brand that extra boost and value. These inflatable chairs/laybag beds are quick and easy to inflate, are compact and easy to carry in its own carry bag, and can be used just about anywhere inside and outside! Mobile phones are one of the most important technical gadgets in our lives and we will never leave home without this one and it’s not hard to see why as with most of us being able to use it as we drive. 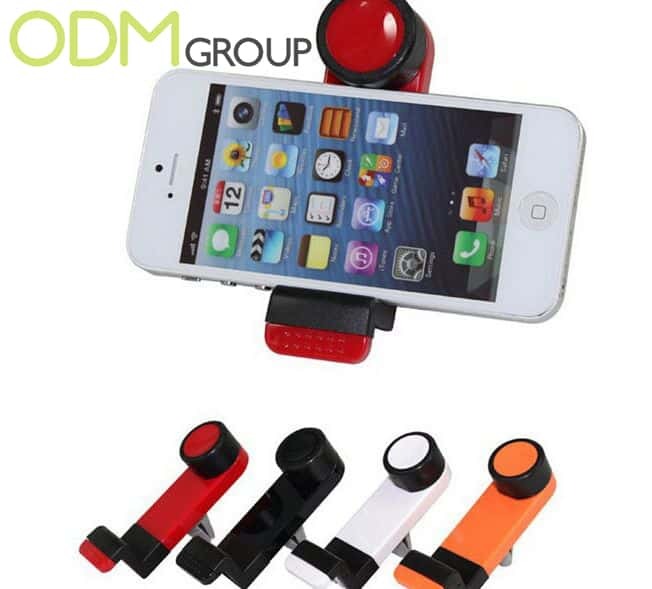 Of course we cannot be distracted while driving cars and this branded phone holder provides a easy hands free solution. This branded phone holder makes it legal and accessible. Just fix this universal custom phone holder onto your car air vent and keep talking and use it even as a car navigator. Besides, the mobile phone will be in plain sight and easy to use, also reducing the fear of using your phone in the car. Torches make great promo ideas as they are one product where its practically has not been modified throughout their use and why not? Because its good and reliable. That’s why people will think about buying this brand new two in one promo torch, as it is enough to only change the batteries and it will serve you for a long time and is one item that is a necessity for the in the house. In addition to this promo ideas ordinary use it can be used in the house as a helper during repair work and during hiking, camping and the outdoors. Music can improve our mood and change our representation about any place, just remember the importance of music in restaurants or cafes. Music is all about having a good atmosphere and just imagine how music is important to us. We listen to it at home, outdoors, on the way to work or even at work. And we all know what kind of catastrophe it can be if we will forget our headphones at home. So here is one phone promotion idea to let you enjoy your favourite music whenever. A bright looking kitchen promotion product, not only decorates your kitchen but adds bright colours to your life, all which is necessary for people who look and enjoy cooking. As promotional items, this silicone colander and mat can be good example of gift with purchase, as an in store marketing item for displaying items and branded gifts with kitchen promotions. A colander appeals great to the kitchen equipment and foods industries. With this being said why not choose these promotional kitchen itemsfor your next promotion? These days, people want to be healthier and beautiful, especially since the world’s population are recently becoming more participative in doing sports activities and sports.This is a general reason why there is an increasing popularity for attending the gym. This has led to the spread of sports nutrition. Sport nutrition can help increase body weight, muscle and can help in losing weight, and this custom shaker will help you to mix everything however, whenever you want without having to use mixing utensils. Summer is coming and along with summer comes a lot of fun and promotional product ideas. As one promo idea, never forget the branding power of inflatables, the perfect ideas for using on holiday abroad and in the garden. Beach balls especially have always been a safe option providing lots of brand exposure so why not create your own design? Ball games not only reflect our childhood memories but even as we get older they provide an incentive to participate in activities. Darts first appearing a few centuries ago has since then became a game that has gained popularity in many countries around the world. Nowadays there are over 50 varieties of this kind of entertainment, but you may be surprised by our drink industry promo idea. Plates are great products because they make universal kitchen equipment. Perfect for displaying snacks for those film munchies, for entertaining guests at parties. And of course do not forget about sporting season gatherings! Here is one great idea for your sports promotions – customisable snack plates! 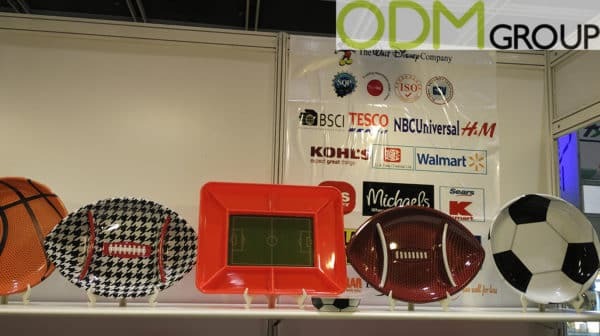 These plates are shaped to represent different types of balls – rugby balls, footballs, basketballs and even a basketball stadium, suitable for any sports event! Looking for a unique marketing idea for drinks industry? There are so many promotional solutions for beverages brands, but of course no one wants to use a hackneyed idea. And it is not hard to see why – in such a mature market you really need to stand out among competitors. 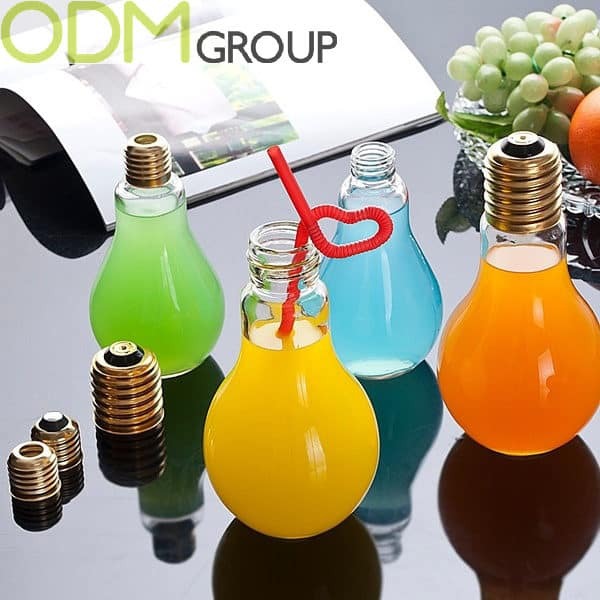 Here in ODM we have a creative promo idea for beverages, just for your business – Light Bulb Drinking Glass. It is important to say that light bulb promo glasses are made from completely safe materials. It is a high-end product so do not be afraid that your customers will hurt themselves while drinking from this glass. These light bulbs can stand on a table as regular glasses thanks to the flat bottom. t is said not to judge a book by it’s cover, but how about Drinks Promotions? 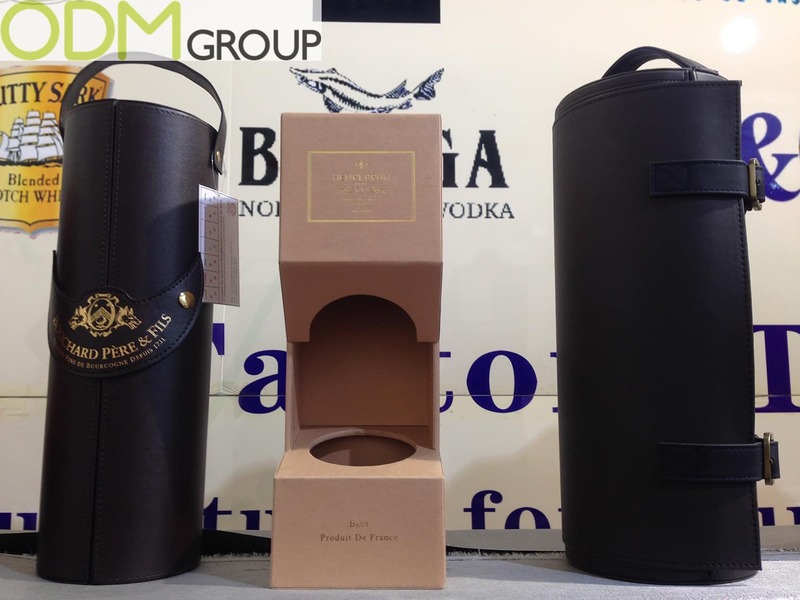 With these Custom Leather Packaging, your Drinks Bottles will be sure to catch eyes and have a greater perceived value. These amazing promo packaging are made of good quality leather. Wine, champagne, cognac or whiskey would fit great in these beautiful gift boxes. Each case is unique, so should your brand have a specific style, then the leather packaging can be customized to fit your brand image, with straps, clips and many more. 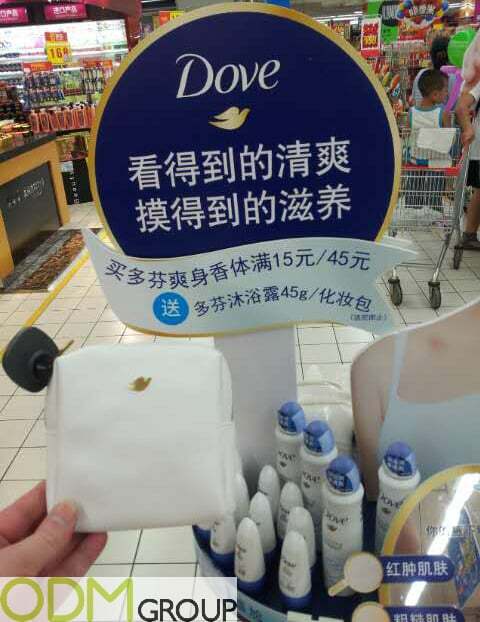 Summer is coming, and Dove, one of the biggest skincare brands in the world has got it sorted with their newgift with purchase campaign currently in Zhuhai. So stock up and feel fresh for those hot summer days! Doves promotional campaign means that with every purchase of more than one Dove Anti-Perspraint spray and roll on Deodorants, you will be entitled to receive a free Dove Branded make-up bag! Perfect for storing your essentials! Summer is a time for bright colours. 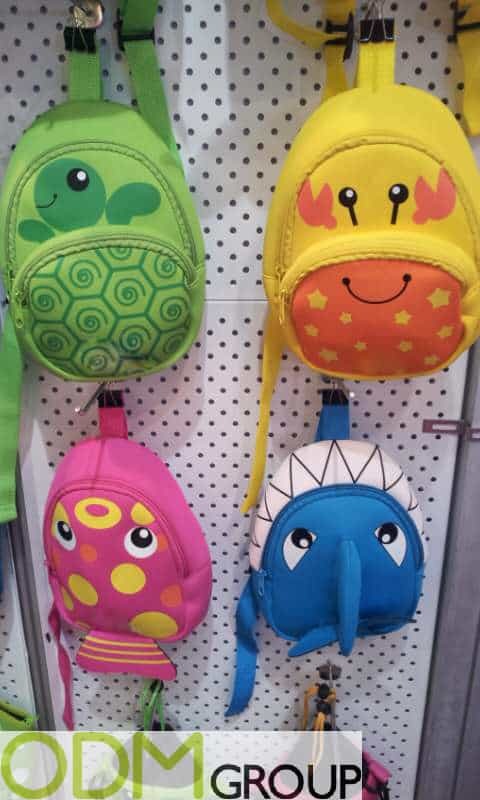 And here is a bright idea for your summer promotions – custom neoprenebags, kid’s swimming aid vests, and balls as cool way to attract attention. Recently, neoprene is gaining huge popularity, so why not try to capitalize on this? Neoprene itself is soft, elastic, durable and water resistant, everything you need for enjoying time in the water. Available in designs such as this fish, turtle, crab and shark designs, be ready to enjoy your day at the seaside! Video games never can be out of date, so that’s why modern entertainment industry engineers are working so hard to surprise gamers around the world. 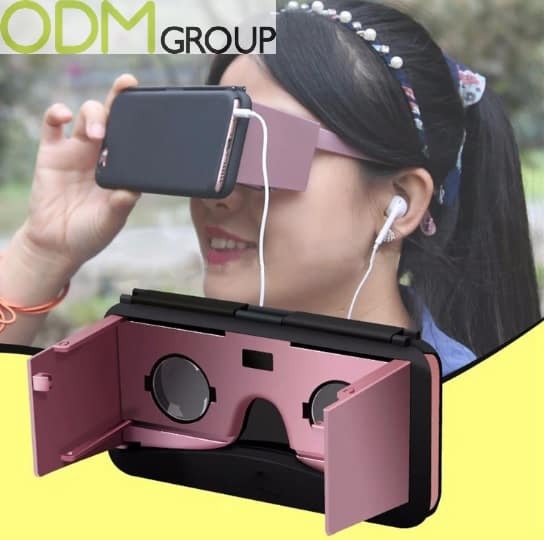 This leeds to the creation and the mad growth of branded VR goggles popularity. Make your brand trendier with this innovative marketing. bet you’ll agree that it’s annoying when drinking tea and leaves enter your mouth. With this custom tea infuser idea you’ll never need to worry about this anymore. Luxury fashion brand, Calvin Klein, never fail to bring out new seasons styles and for their recent promotion they are currently giving away a complimentary Calvin Klein branded card holder free with every purchase. 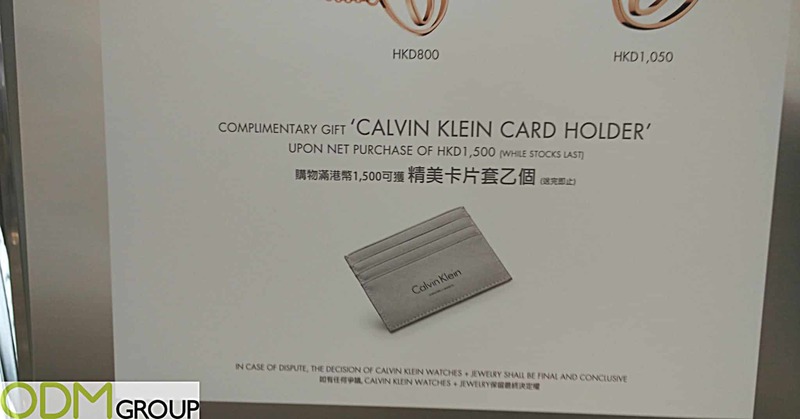 To claim this gift spend HKD1,500 or more on Calvin Klein’s collection of jewellery and watches. This custom microfiber towel takes up little space, absorbs a large amount of moisture and dries very quickly! And we cannot mention that it is also great outdoor promotion idea because it can be easily branded. 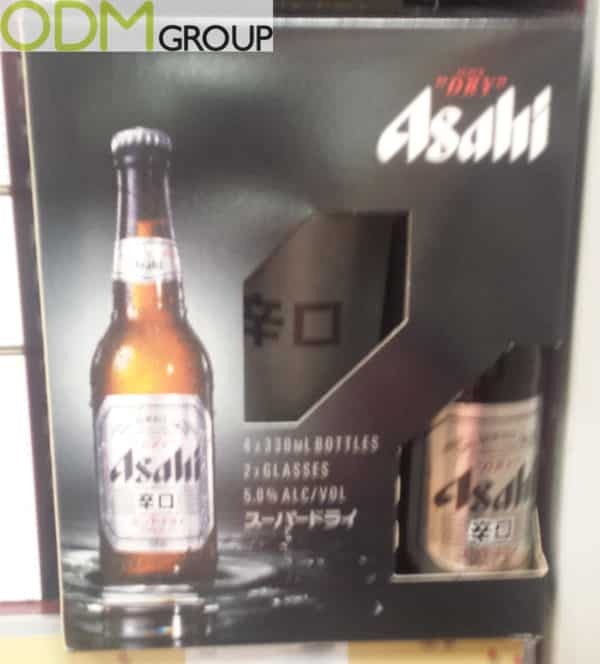 Leading Japanese brewery and soft drinks company Asahi Breweries, Ltd. is currently offering a nice on pack promotion with their famous “dry” beer. This gift set promotion by Asahi offers one of the most useful promotional products for drinking- branded beer glasses, which with the purchase of this package of Asahi beer could be yours. The drinks business is known as being very competitive. That’s why all beverage companies are always looking for new marketing ideas in order to attract and retain customers. The main thing here is to choose the rightpromotional product.This beer promo idea for Wooden Stand with Bottle Opener is the perfect promo product. 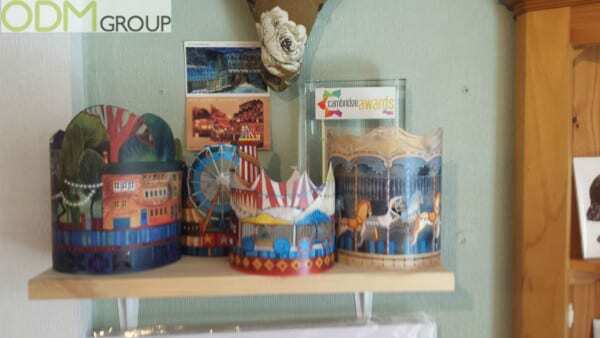 We all love to own keepsakes from our travels, and Discover Singapore stores are offering an exclusive souvenir promotion to provide just that. Simply make a purchase of $88 or more in a single receipt and receive this freepassport holder exclusive to Discover Singapore. 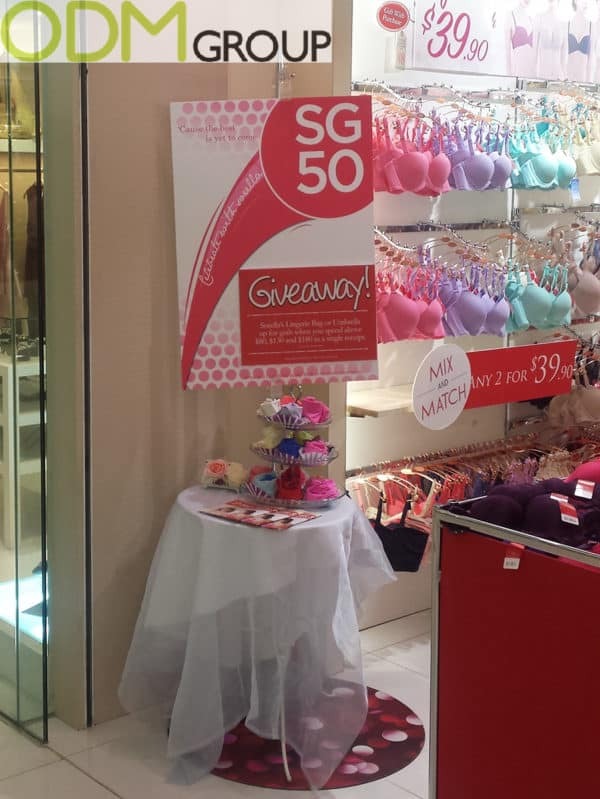 Renowned Singapore based lingerie brand, Sorella, are offering customers some very useful promo giveawayitems! For this promotion they are offering lingerie bags and umbrellas as nice gift with purchase. To receive simply spend above $80, $130 and $180 in a single receipt. Superheroes be it in comics or in movies are popular worldwide. 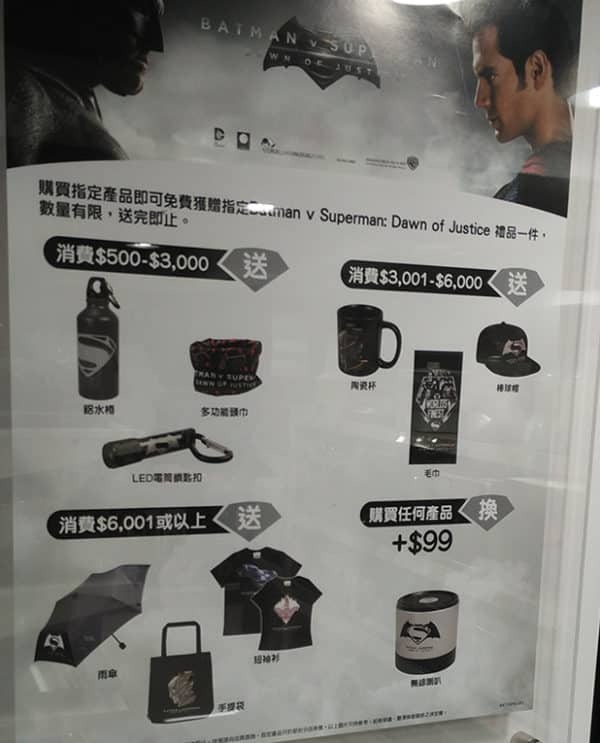 Companies like Fortress have taken note of this, and are offering a wide range of movie merchandise items from the ever popular DC Comics characters – Batman and Superman. Pens are very good and practical gifts for a business to advertise, but what if we offer you something more than just pen? 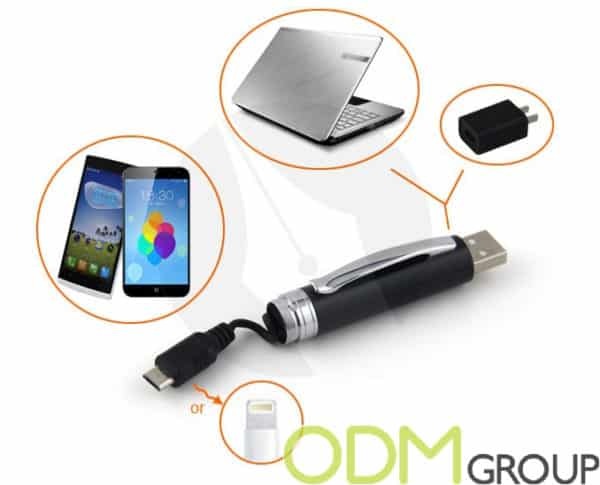 This unique promotional idea not only provides you with ability to make notes but to also charge yourmobile phone! This unique promotional pen is available in any color so you can choose the color which is connected to your company or brand. There is also great branding opportunity of printing logo’s. The refill ink could be black or blue. Well, this item is fully customizable. 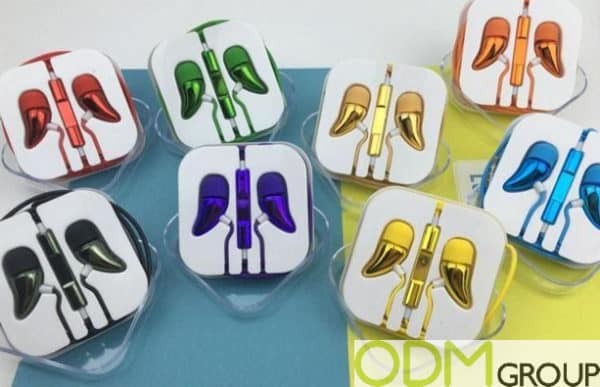 Here is a bright idea for your brand promotion – colourful custom earphones! Most people never leave their homes without their earphones, so show off these custom ones whenever you listen to music. 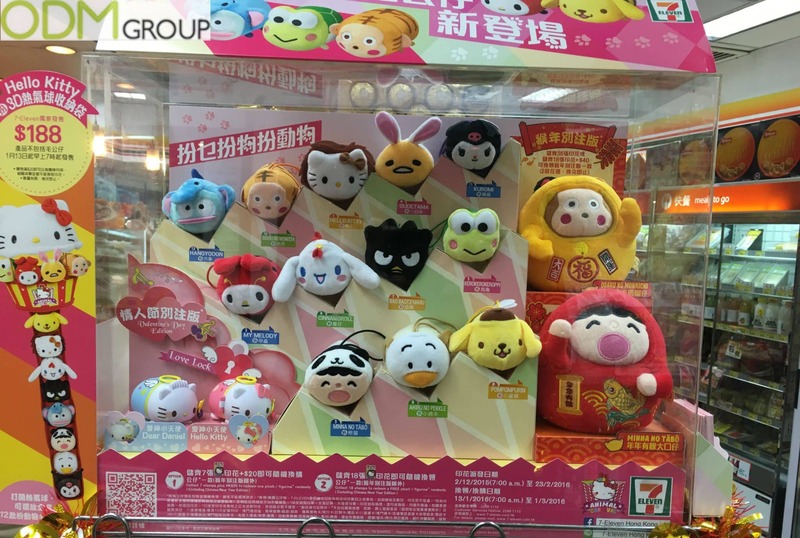 Promoting your own custom plush toy is a nice way to market. 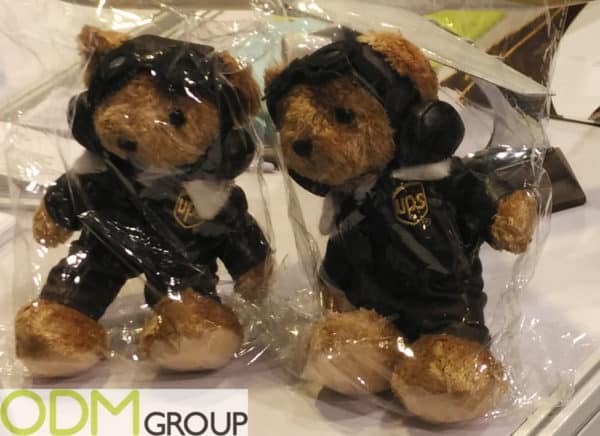 Being the base for many good childhood memories this promotional mascot for UPS is a great example of how branding and toys can be promoted. 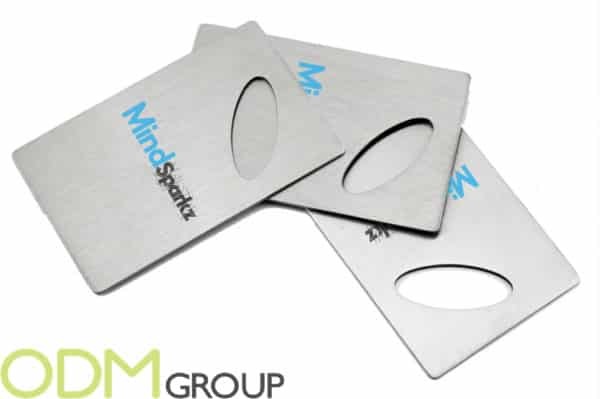 If looking for a really useful promotional product that’s small, handy and can be fully customised, then this credit card bottle opener may do just the trick. As a fantastic marketing idea for the drinks industry and any industry giving away this practical product, this bottle opener has its advantages. Made out of a sturdy stainless steel material it’s durable and will serve your customers for a long time! Pens are always good and practical items for a business promotion so differentiate yourself from competitors with the promotional plastic pen with customizable clip! 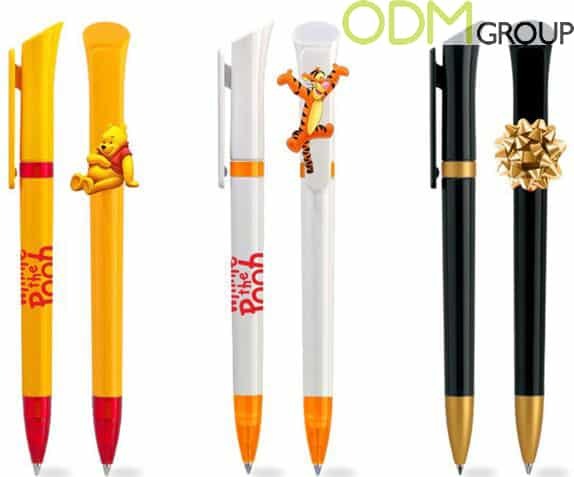 Pens are always in demand and in this case provides your brand with really effective advertising. Stone power bank – is original and useful customizable promo idea for you mobile phone. With this promo product having two slots for charging and is suitable for any gadget. In this case you can charge not only your smartphone but any portable device be it torch, portable Bluetooth speaker or MP3 player! 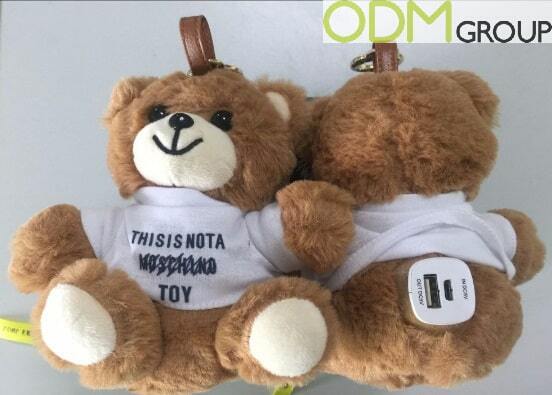 This promo power bank idea is a good solution for those who love plush toys and appreciate usefulness of a marketing product at the same time. This amazing plush power bank will charge your phone when needed and also will cheer you up! 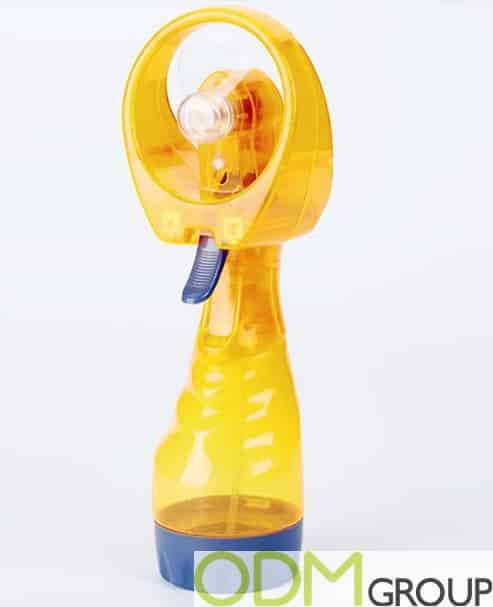 This portable water spray fan could be your helper in the heat. During the hot summer days this cooling promo idea will help you to feel cool and comfortable! 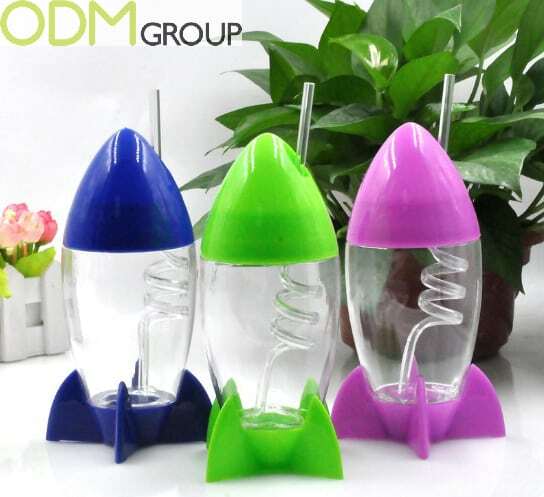 These custom rocket bottles are such a good example of promotional product for soft drinks and juice companies. This idea is good because it will be used for its intended purpose with your drink brand. Can be offered as a gift with purchase or as an on pack promotion something no child can resist asking their parents for. 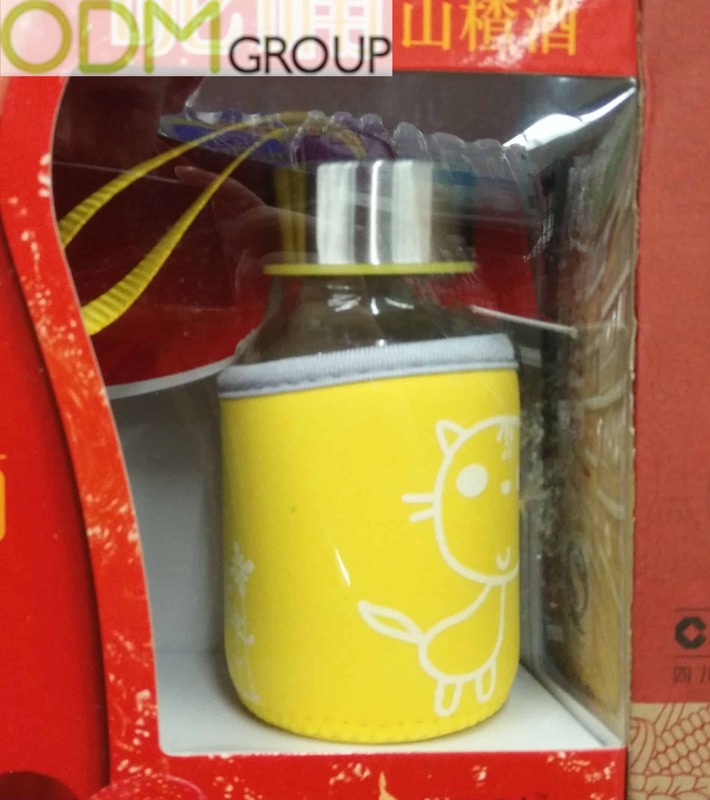 Kids Promotions – Custom Rocket Bottles. Offering a marketing gift with a big area for logo placement is the easiest and best way to achieve greater brand awareness. 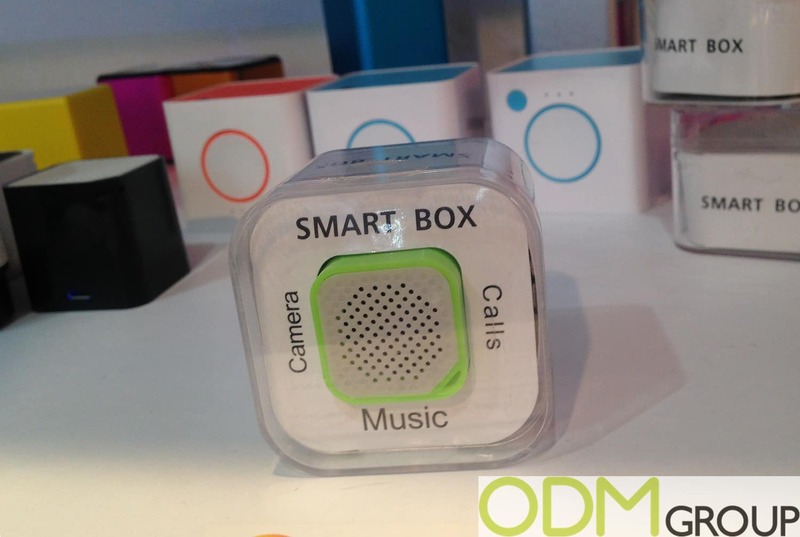 This Bluetooth speaker is a pleasant and unique innovative idea to surprise your customers and to increase profits. The advantage of this epoxy doming Bluetooth speaker among others is its shape, which allows customers to also use it as a phone holder. This promo item can be full color printed and logo can be placed on its epoxy dome. The logo position will be enough that having a quick look at this promo product and for customers to easily recognize your brand. The sense of smell plays an important role in our lives. Smell can raise sentiment but sometimes unpleasant smell can spoil the impression. With this unique promotions idea you will be surely remembered. Bamboo charcoal bag air freshener is available in different sizes, therefore can be used for different needs. 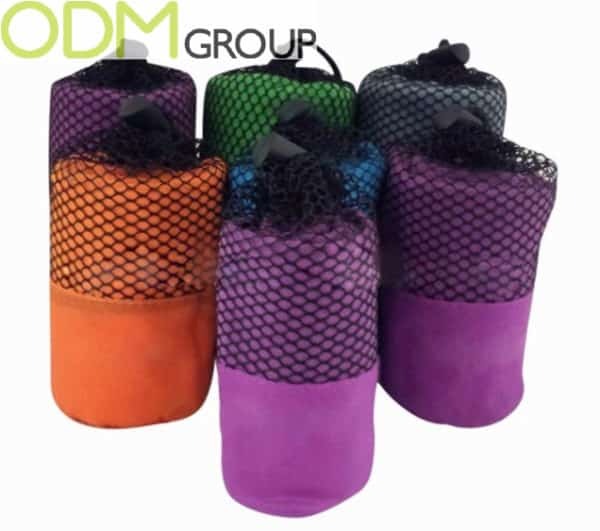 For example the biggest promo bag will be a perfect freshener for your home, the middle one good to use in car, and the smallest promo bag will fresh your shoes. 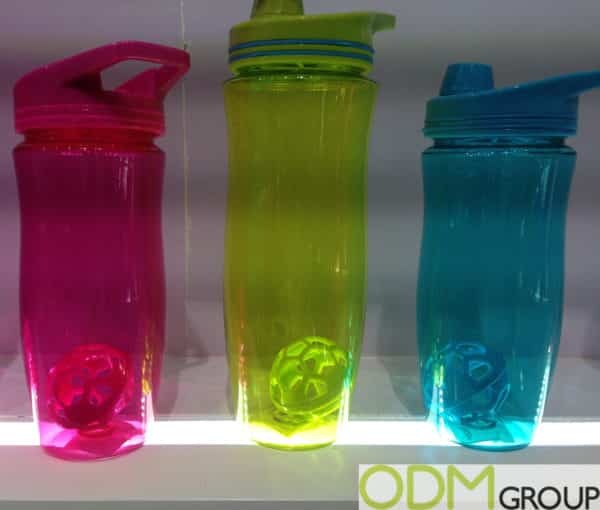 What is the best promotional product for drinks companies? 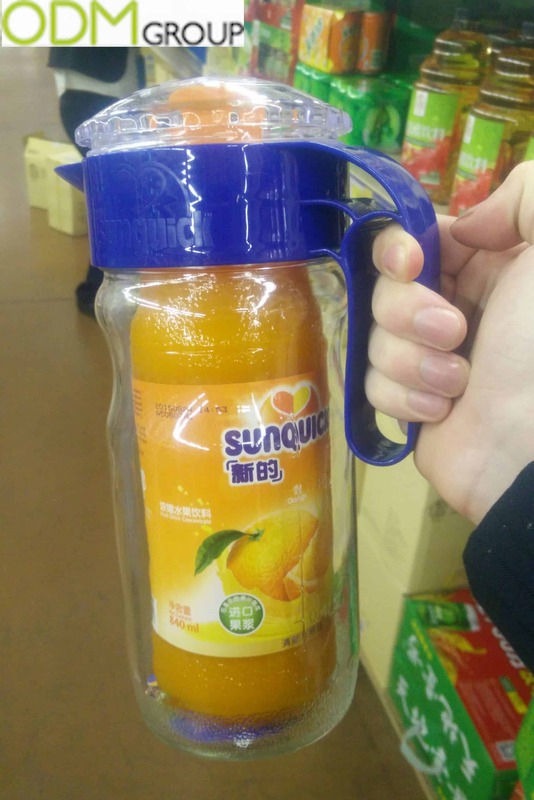 Of course the product which customers can use during drinking. So there are a lot of ideas like expensive luxury items like wine aerators to cheaper items likebottle stoppers and bottle openers. The best options though for drinks industry are glasses and wineglasses. That’s why this custom whiskey glasses is perfect promotional item for The Macallan Whiskey. 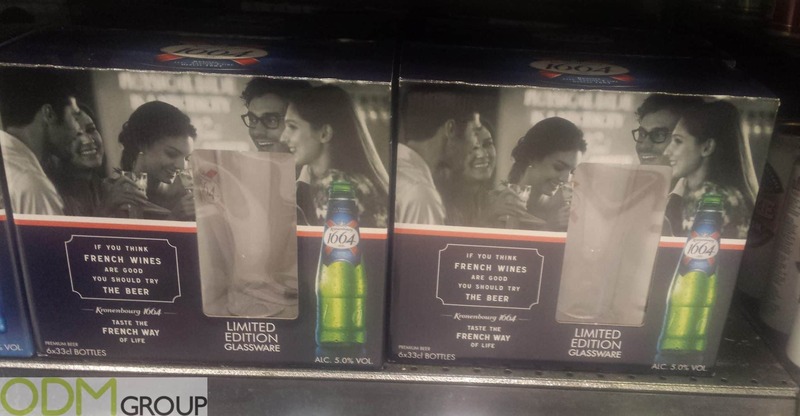 It is not hard to see why drinks companies year in year out offer to their customer glasses as a gift with purchase. 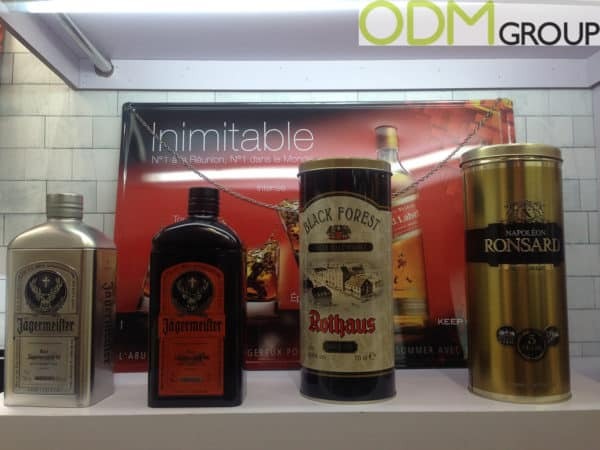 This product is the best for beverages promotions due to its ability to be fully customizable and its usefulness. It is well-known that cookie producers are always having difficulties in searching of right promo idea for their product. We used to get some small promo items as a gift with purchase of cookies. It could be cookie shapedkeychains, mobile phone rings or USB’s. But there wasn’t good cookie promo which can be used with exact product. Now this is the past, we found this on pack cookie promo product to boost your sales. 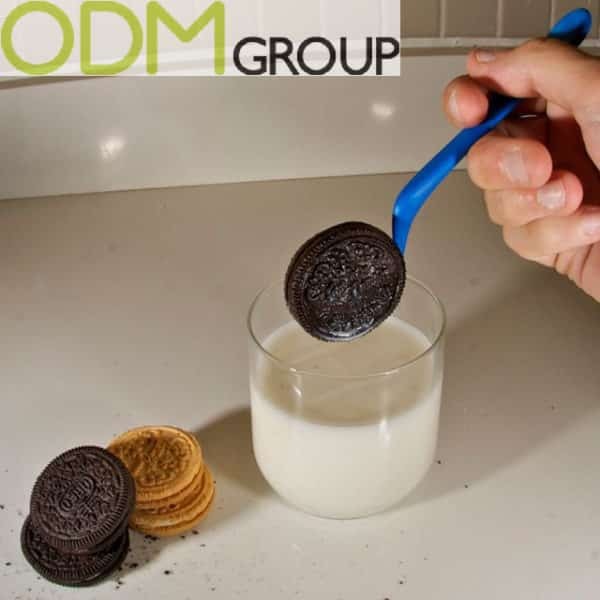 The Cookie Dipper is perfect for keeping your hands out of your drink but get your cookie good and dipped. At the summer no one wants to stay at home. That’s why during whole working week we are in anticipation for weekends. Summer is a great time for picnics, pool parties and outdoor leisure. But can you imagine any leisure without food and drinks. This summer marketing idea is just perfect for a holiday. 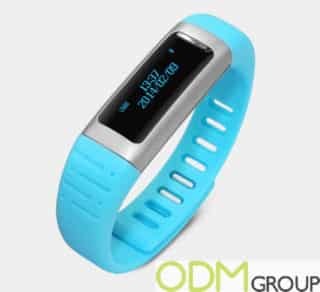 It is difficult to work out at the best of times, but with this new custom fitness tracker promotional idea, your business can offer customers a solution and help them to stay motivated and keep on track. These promo items can offer customers a wide variety of features including tracking their heart rate as well as monitoring their sleep. 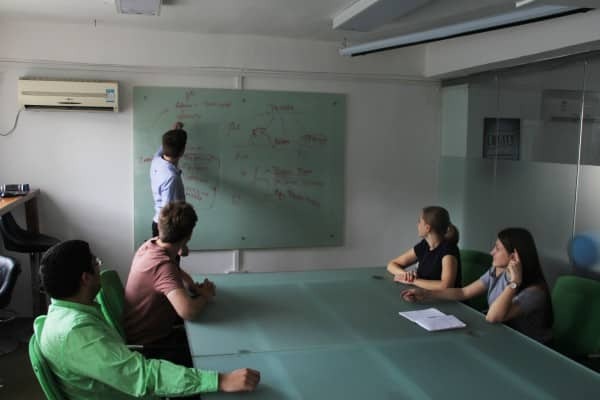 The office desk is where most of us spend the majority of our waking hours, and it says more about us than we think. With this new quirky office promo idea you will be able to new breathe life into this space. 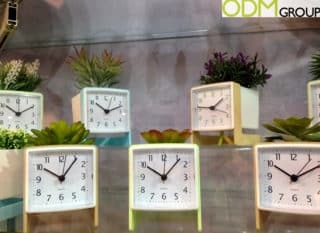 These quirky office clocks come in a unique wood or soft pastel frame. This office promo clock also comes with a plastic succulent plant on top. This not only provides a striking and on trend look, but will also add some personality to your desk. With the Rio 2016 Olympics in full swing, McDonald’s partnered up with the Japanese communication app Linefor a Gift With Purchase campaign with Happy Meals. 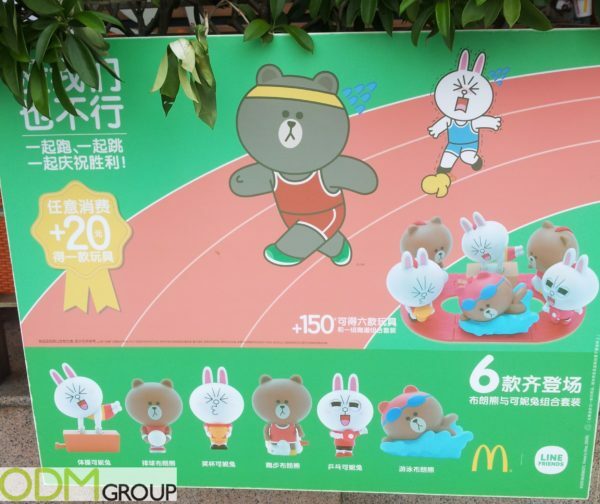 With every Happy Meal comes a free toy: one of the six Line mascots depicted as athletes. China always sends many athletes to the Olympics, and given China’s Medal count, the Olympics are very popular. Although combining alcohol with tea might sound a bit odd, Bénédictine created their own trend: The Jasmin Bénédictine. This drink mixes the famous herbal liqueur with fresh hot jasmin tea, which results in this very unique cocktail. Bénédictine designed a special Gift with Purchase for the Singaporean market: when buying a bottle of Bénédictine Liqueur, customers get a custom glass to recreate their own Jasmin Bénédictine. Wine has been around for so long that it might be difficult to come up with new products for Wine Marketing. These umbrellas beat the odds and are fun and innovative. Shaped like wine bottles, these umbrellas are a unique item and offer a new perspective to your Wine Marketing campaign. Who doesn’t like gift umbrellas? It should be noted that there is a difference between GWP Vs. Give-aways. You need to buy a product or service in order to get the promotional product when using a GWP mechanism. Give-aways are often used as street promotions usually given out by brand ambassadors, hostesses, mascots. However, having recently been on a bike tour and having bought a service, the organiser surprised us with branded water bottles, shoe bags and towels. It was unexpected yet it did not influence my decision to buy the tour. I think this situation qualifies as a give-away and a GWP. Given the higher value of this unexpected gift, it had far more impact than it would have otherwise had, and therefore this is an excellent way of Marketing Gifts. Many of our clients also ask us what they should opt for. Which would you choose when given the choice of GWP Vs. PWP? Its a tough one. We certainly love a good free gift, but a Purchase with Purchase promotion is an excellent way for marketing managers to maximise budgets. If done well they pay for themselves and you can do a much higher quality promotional product. Done well, we certainly push clients to consider PWP very strongly. That being said, for on-pack promotions you are creating a bundle for a gift and this option does not work as efficiently. With PWP promotions, the main risk is arises when clients might not choose the item, so therefore it is important to focus on product design. All in all you need to know your customers and what makes them tick. Finally, create a buzz through promoting a limited production series to minimise the chance of being caught with leftover stock. This also creates an incentive for the consumer to buy the product during a limited period/series run. Check out more terms on our Promotional Products Glossary. Related to Gift with Purchase, you might also like to learn about Giveaways,In Store Display, Covermounts, On Pack Promotions and Purchase with Purchase promotions.